Hello and happy spring! It has been almost two months since my last post, and truly two months since my last recipe post. I have been preoccupied with a big project these last two months: starting my Etsy business, Odudare! I have been working on it for years, and I even opened the shop early last year, but it’s only been in the last two months that I finally started adding items to sell and promoting it actively. It is my hope, and my dream, that I will eventually be able to quit my day job and do Odudare full-time. For the time being, at least, that is not possible, and it has been difficult working 40 hours a week and trying to work in my studio in (almost) all my spare time. Needless to say, The Wooden Spoon has taken a backseat amidst all this excitement and work. I know I can’t do everything, all at the same time, but I really want to! The past three days I have been home sick. Strep throat, common cold, flu- my body can’t decide what it has. Maybe it’s backlash from working so much, but I’ve had to step back and give in to my body, doing nothing but lying on the couch watching TV and moaning (funny, huh?). Today, my last day of rest before returning to work, I am finally starting to feel better, and I decided to give The Wooden Spoon- and Misha, who’s now sick as well- a little TLC with cheddar cheese biscuits. 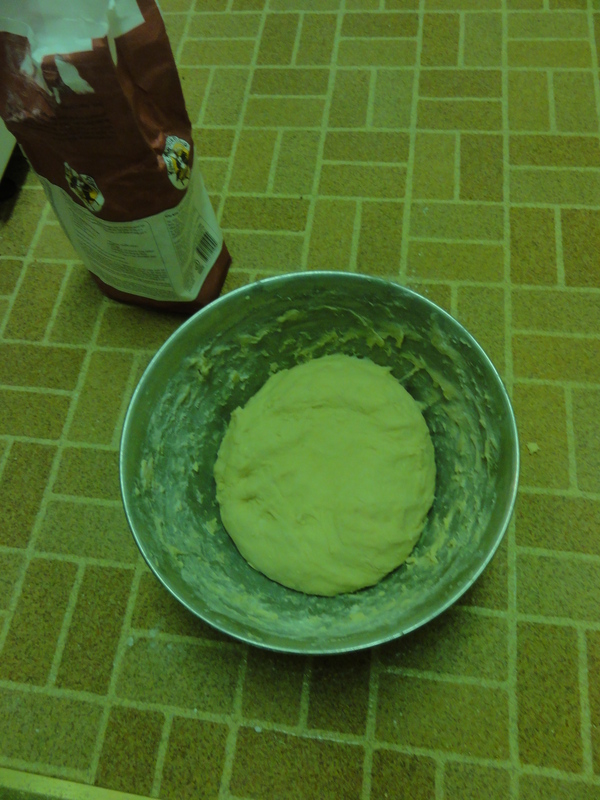 The dough after kneading. There's that wooden spoon again! This has been the recipe I’ve been planning on making next for two months. It’s been floating in the back of my mind, saying “make me, make me!” I love biscuits, and a new breakfast place near our house makes awesome ones. Homemade is always better though, and I was sure Grandma’s recipe for cheddar cheese biscuits would top the breakfast place. Oh how right I was! I love it when being right tastes this good! I only had almond milk and earth balance vegan butter sticks on hand, and given my condition, I was not going to the store. Luckily, they substitute just fine for real milk and butter, and my biscuits turned out light, flaky, and perfect with a little bit of (real) butter and jam on them (I had enough real butter for spreading but not for shortening!). They were also SUPER easy to make, and use ingredients you probably already have on hand. 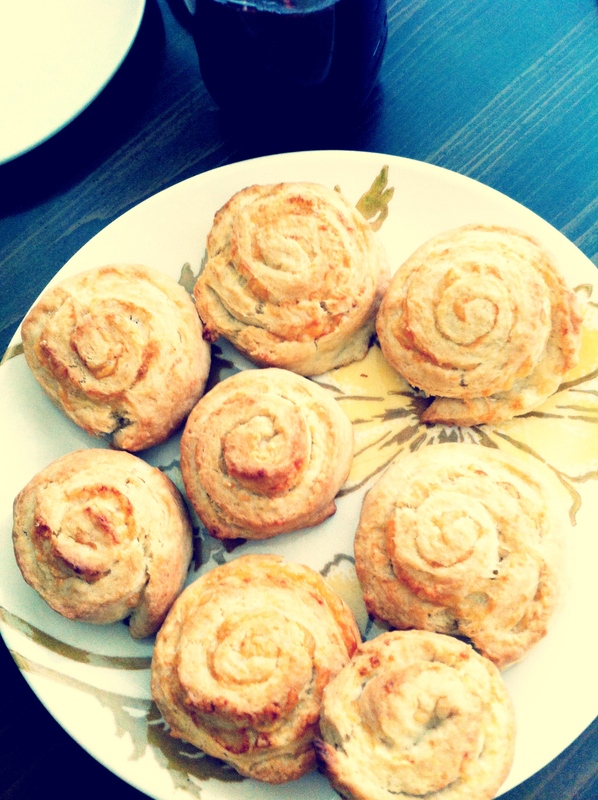 I might even claim that these biscuits are the perfect antidote to spring sickness. Make them the next time you’re feeling low, with a nice cup of tea, and see how much better you feel! p.s. A little marketing on my own blog can’t hurt, right? Next chance you have, check out my Etsy shop, Odudare. You will find awesome, affordable handmade pillowcases & coasters, as well as super cool hand-printed art and collages. And more to come soon! 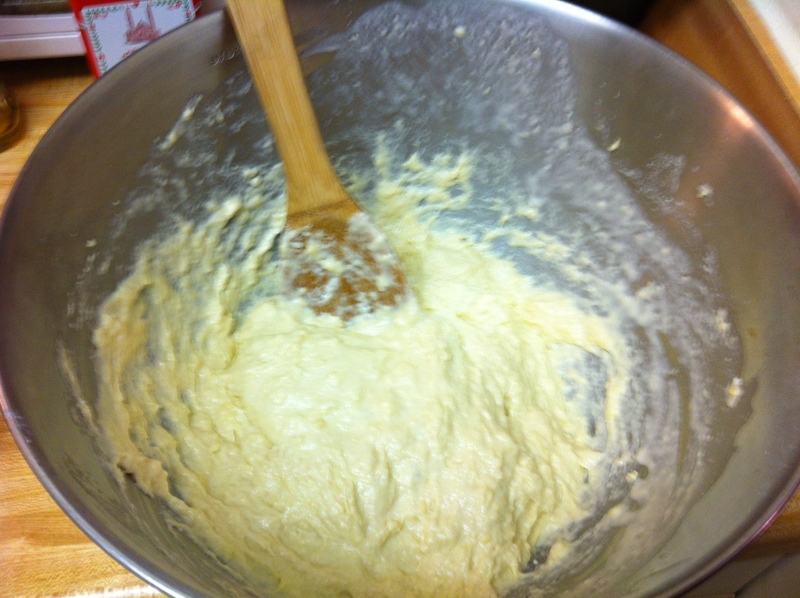 Whisk together flour, sugar, baking powder, and salt in a medium size mixing bowl. Cut in the shortening until particles are fine. Cutting in shortening is easier with the help of a pastry cutter/blender. It is also helpful to cut your shortening up into tablespoons before adding it to your flour, rather than just adding a solid block of butter. Add milk all at once, and stir until dough clings together. Knead lightly on floured surface 12 times, or until your dough becomes soft and pliable. If your dough is too sticky, add a little bit of flour. Roll or pat out to an 8×6 rectangle. Considering that I doubled the recipe, I thought my rectangle should have been about 16×12, but it was a bit smaller than that. The main thing is that a) you want a rectangle and b) you don’t want your rectangle to be too thick- about a ¼ inch, maybe a little more at most. 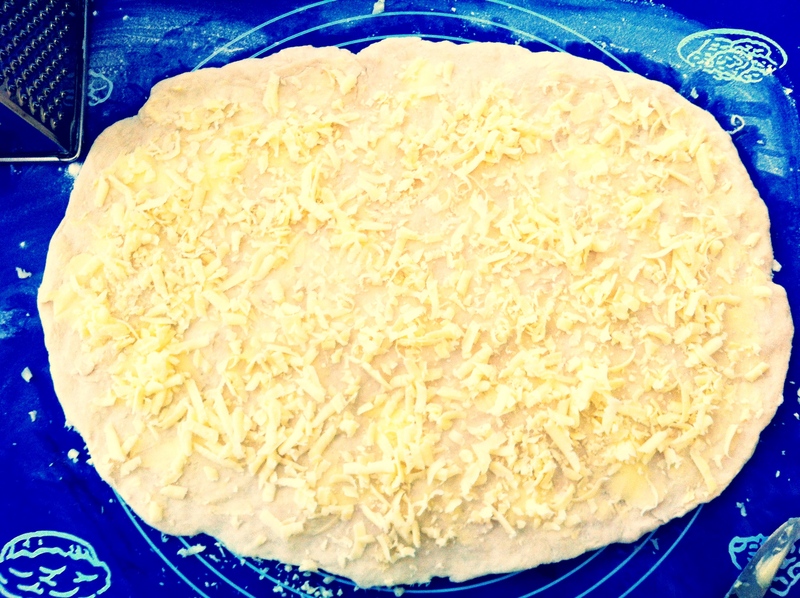 Spread soft butter all over your rectangle and sprinkle with cheese. Starting with the 8 inch end, roll up jelly roll fashion. 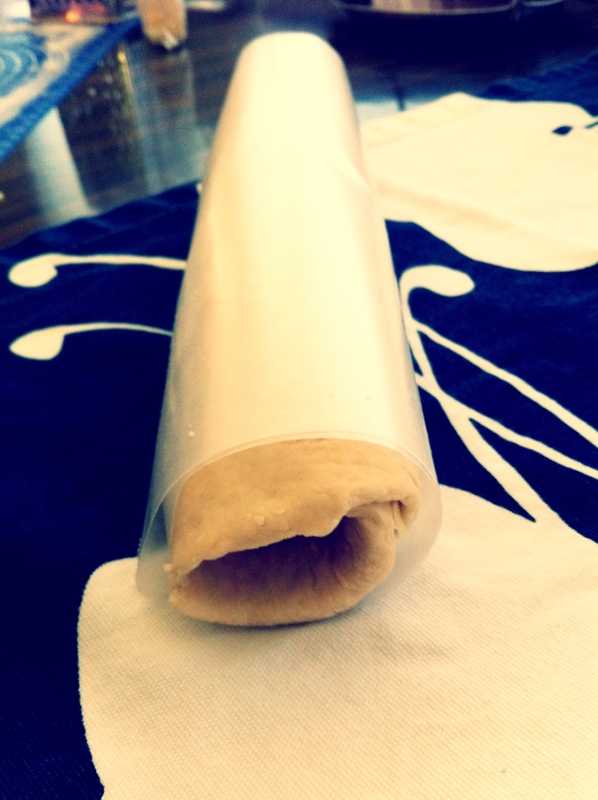 Wrap in wax paper and refrigerate at least 15 minutes. Once you remove it from the fridge, take it out of the wax paper and use a sharp knife (I used a serrated bread knife) to cut your roll into about 1 inch thick pieces. Spray a baking pan with a high heat baking spray, and evenly space your biscuits on the pan (like you would with cookies, only biscuits don’t spread quite as much). Bake at 450 for 15-20 minutes. Be careful not to let them get too brown, though they should be golden and puffy. 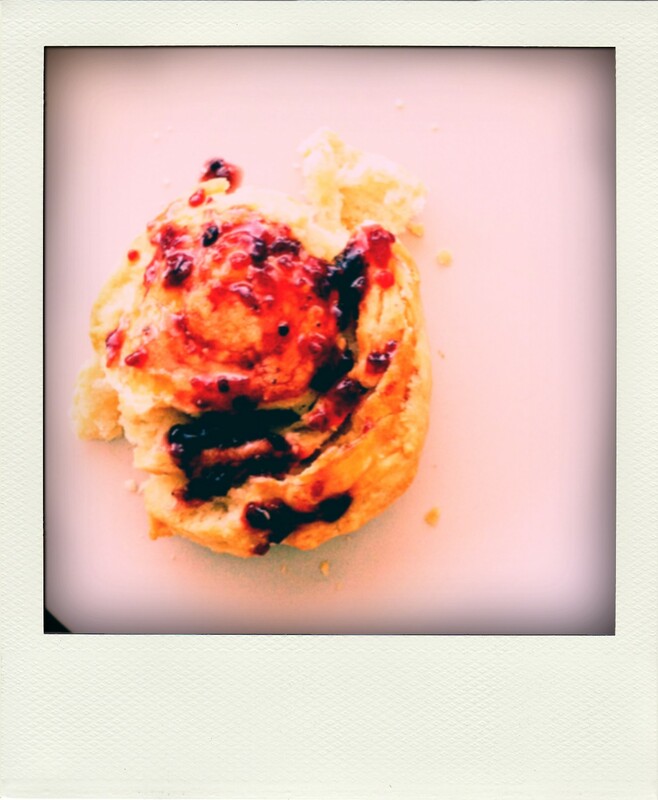 Spread with butter and jam and enjoy! 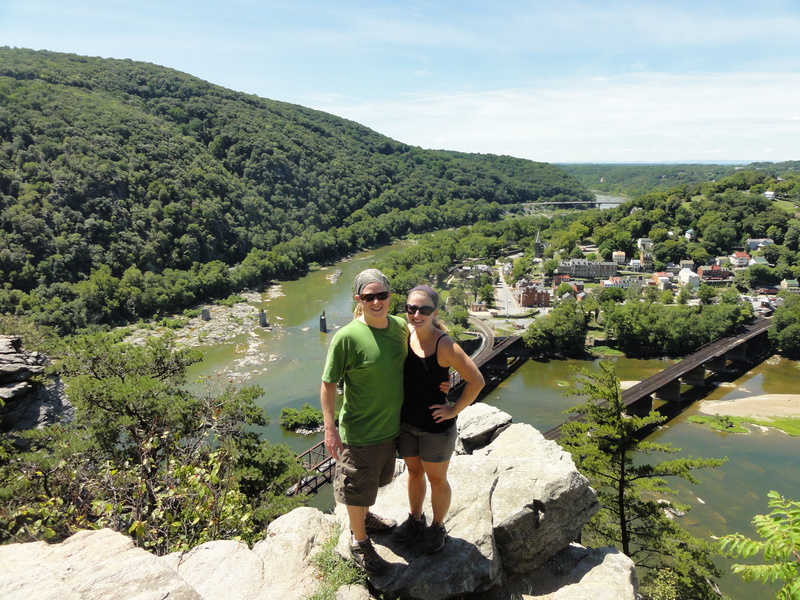 Thanks for the awesome photo and comment, Mom! You, too, can choose to substitute greek yogurt for sour cream anytime- you really can’t tell the difference, and it is much lower in calories. On a day-to-day basis, I try to be not just vegetarian, but vegan, and as healthy and low-cal as possible- but when I make Hungarian food, I want that sour cream! Maybe one day I’ll make low-cal Hungarian food, or even vegan Hungarian food, but for now I think losing the meat is challenge enough! 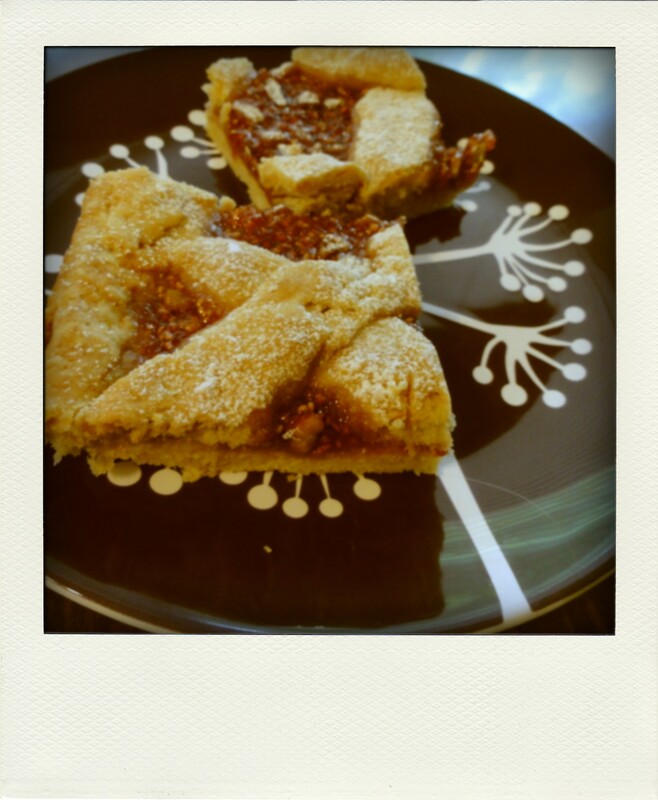 Sharing is an important aspect of Hungarian food and cooking, and my Mom’s sharing gave me an idea. I have written before that I welcome all your comments, pictures, recipes, ideas, and so on and so forth. I would like to extend that and start a regular “Show & Tell” series of posts. I am often so busy with work, studio, exercise, friends, and so on that it is difficult for me to find time to cook Hungarian more than once a month or so. Ideally, I would love to cook more so I can post more, but realistically I can only do the best I can do, and I think it would be great to expand on my posts to include other vegetarian meals, great vegetarian restaurants I visit, and other vegetarian and/or Hungarian related things. The “Show & Tell” series would feature your first-hand cooking photos, experiences, stories, recipes, and anything else you want to share with me and your fellow readers- a blog show-and-tell. Show-and-tell was always one of the best parts of grade school, right?! I would also love to take reader requests, so if you have a recipe you want me to make vegetarian and post on the blog, send me those as well! This will tentatively be a monthly series, but if I get lots of awesome show-and-tell emails, it can become bi-weekly! Send any and all: cooking photos, old Hungarian family photos, stories- cooking, memories, etc.- recipes, experiences, or anything else you can think of, to sae124@gmail.com. Hope to hear from you soon, and have a great week! 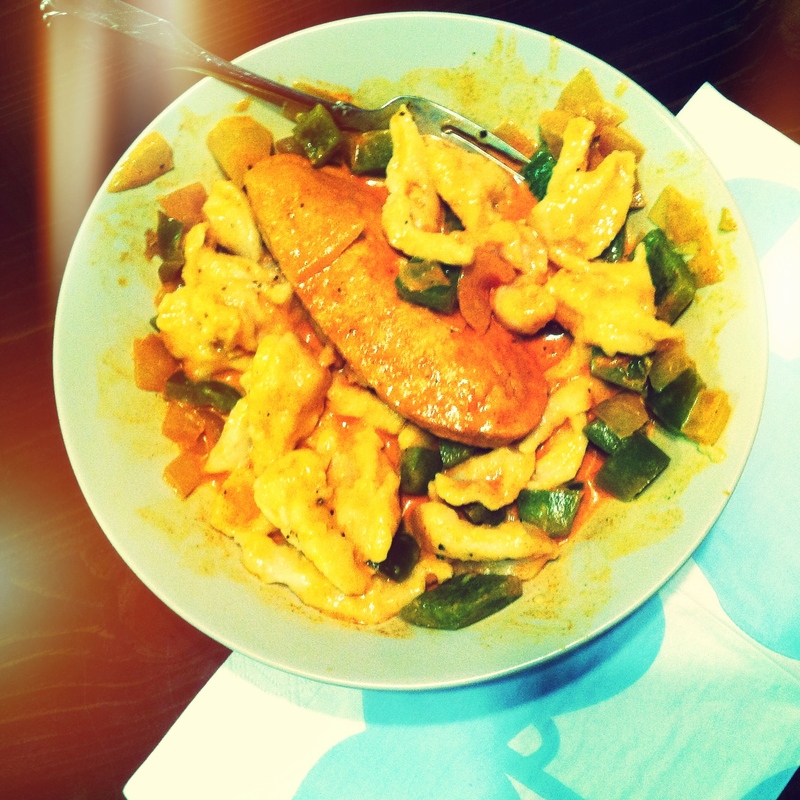 When I decided to try making Hungarian food vegetarian, the motivation came from my love of Chicken Paprikas. 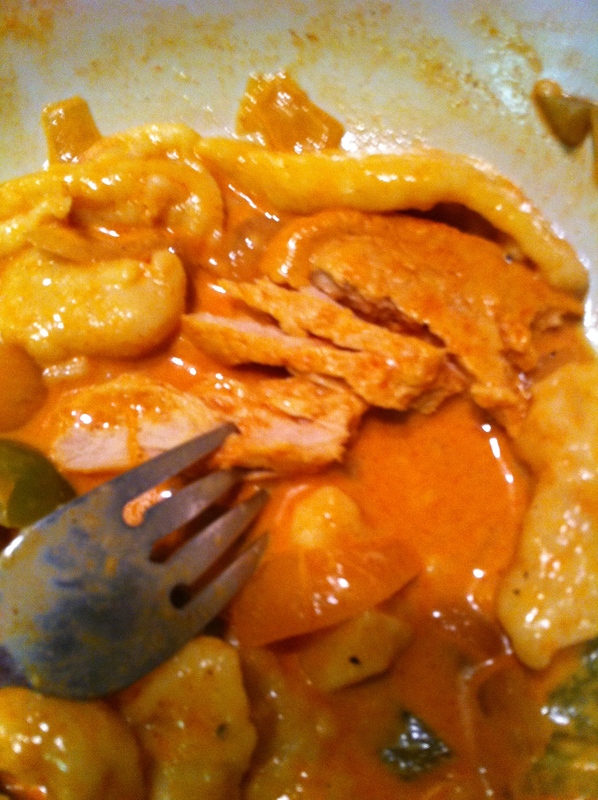 This dish is my all-time favorite Hungarian meal. Growing up, if there was a special occasion and my Mom asked me what I would like her to make for dinner, Chicken Paprikas was my response. Coming home from college, Chicken Paprikas would be on the menu. I loved it so much, I probably could have had it every night. The funny thing is, the chicken wasn’t the star of the meal to me. It may have been the substance, but the star was the sweet creamy sauce, the tart green peppers, and the incredible homemade noodles/dumplings. When I became a vegetarian, my first thought was “How am I going to live without Chicken Paprikas?” Misha assured me that many meat-based meals could be made vegetarian, and even though I knew he was 100% right, I was so scared to try making Chicken Paprikas without meat. What if it failed? What if I really did have to live the rest of my life without my favorite meal?! Well, worry no more, vegetarian Chicken Paprikas lovers out there!!! I finally faced my ridiculous fears and made a delicious, authentic, meat-free Chicken Paprikas, and it is AWESOME. As I said earlier, the true star of Chicken Paprikas is not the meat, and so it survived the transformation fairly intact. Everyone knows the noodles/dumplings are the best part- you would always eat a bit of meat and then a LOT of noodles. 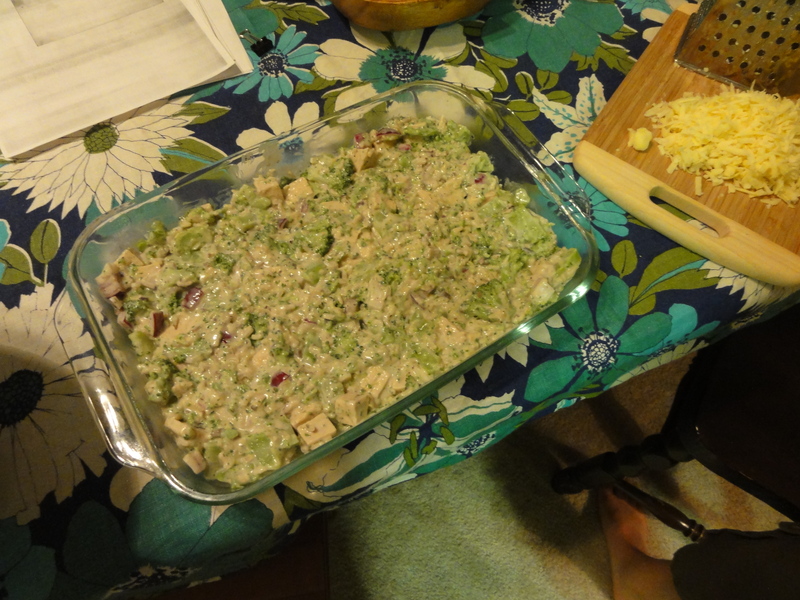 In place of the chicken, I used Quorn, an incredible chicken substitute product first mentioned (and photographed) in my Chicken and Broccoli Casserole post. It is really amazing how well something called mycoprotein (read: mushrooms) absorbs flavor. My “chicken” was nice and tender, a bit pink, and very tasty. Of course, I made a TON of noodles (after lots of dough beating and numerous frantic picture text messages to my Mom asking if the dough was the right consistency), and the dish got DEVOURED by Misha. That means it was a success! I may have cut my green peppers a bit too big. So know this: you need to cut your green peppers smaller than I did! And you may need to go to the gym to get enough upper-arm strength to beat the noodles. But otherwise, this meal is easy, slightly time-consuming, and absolutely delicious. You too will be a Chicken Paprikas fiend, and make it for every special occasion. Speaking of special occasions, I turned 25 on January 24th! 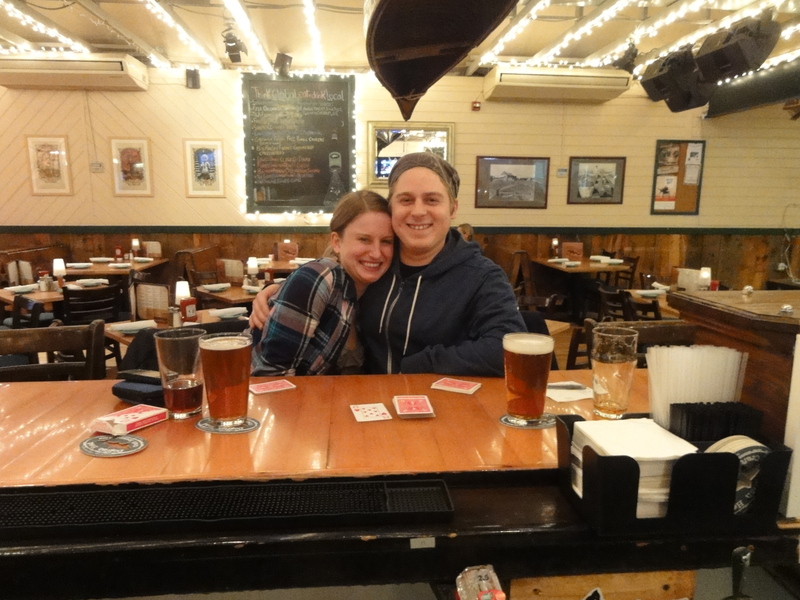 My incredible birthday present from Misha was a trip to the Dogfish Head Brewpub in Rehoboth Beach, Delaware. It’s about three hours from our house, and we stayed in a hotel on the beach and drank fantastic beer and ate delicious food and went for a walk on the beach. It was so fun and relaxing, and such a special trip. I am so spoiled by Misha! To cap off my b-day celebrations, a few girlfriends and I went out for sushi, followed by a vegan chocolate cake with vegan vanilla icing made at work by my friend Emily, and Misha’s Mom made me my favorite spring rolls! Oh yeah, and my incredible parents spoiled me further by buying me an iPhone. It was the best birthday in recent memory (although last year was pretty great too), and I am so lucky and blessed to have such giving, loving, wonderful family and friends! If I had been able to be at my parents’ for my birthday, Chicken Paprikas would have been my special meal. Enjoy! In a large, deep pan, sauté onions and green peppers in shortening until soft, tender, and transparent. Make a “well” in the center of the pan and add a little more shortening and the frozen chicken cutlets. Coat every inch of everything in the pan with a generous amount of paprika. Saute for about 5 minutes, turning the cutlets a couple of times and stirring the onions and peppers. 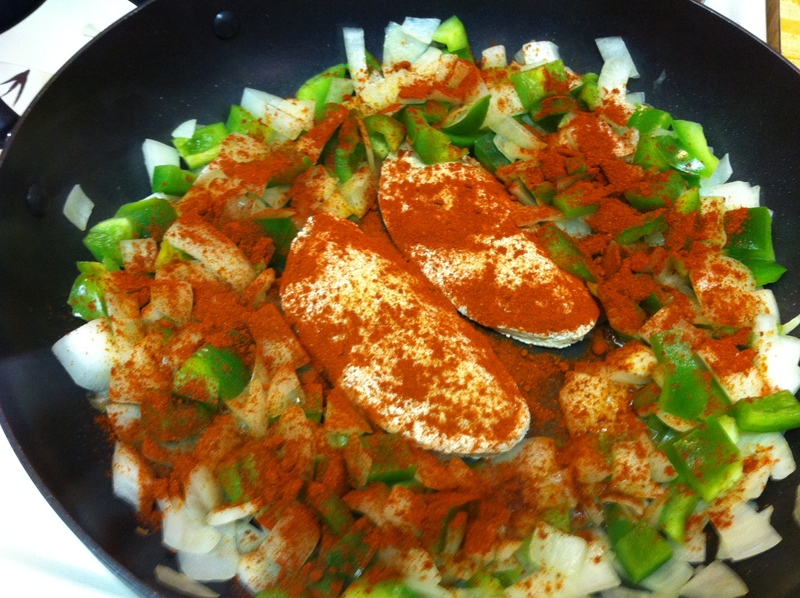 Add more paprika as needed. Add water to almost cover. Then simmer on low heat until the chicken cutlets are heated thoroughly. This does not take long, about 5-10 minutes. While the cutlets are heating, put a big pot of salted water on the stove on high heat and make the dough for the noodles. The cutlets will finish heating before you are finished with the noodles- simply turn the burner off and cover the pan for the time being. Turn the dough out onto a large cutting board, and cut the dough into boiling water in small pieces using a hot, sharp knife. 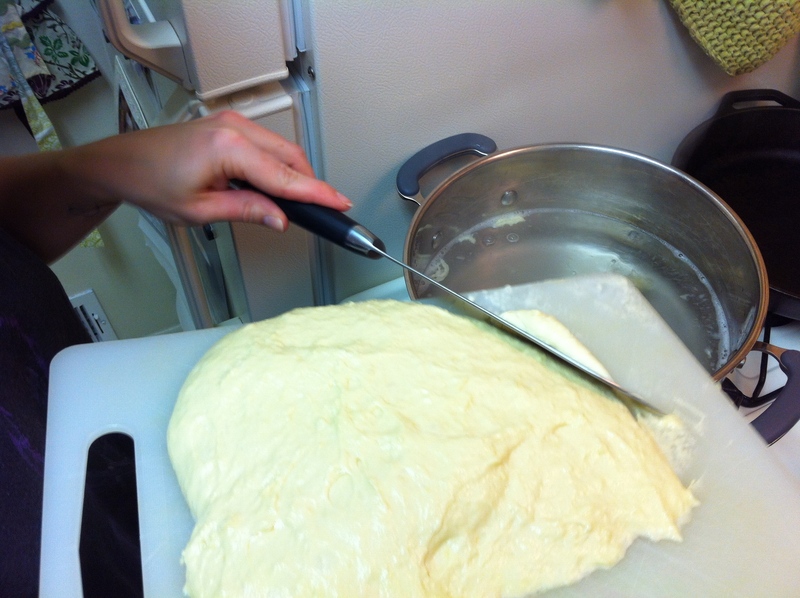 Dipping the knife in the water periodically helps keep it hot and prevents the dough from sticking to it too much. 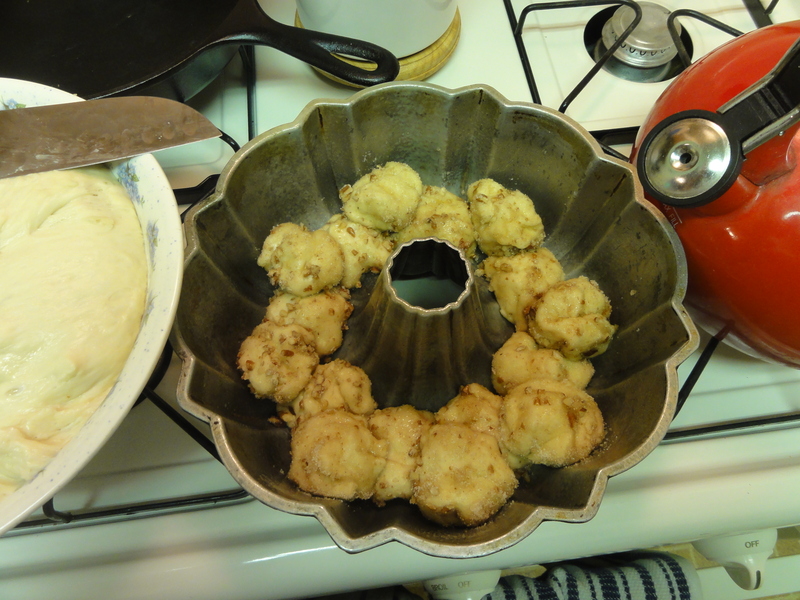 The dumplings will be weird little shapes and if you cut a few too big or too small it’s not a big deal- I definitely cut a bunch of mine too big. Once you’ve cut all the dough in, cook for about 8-10 minutes, or until the noodles taste done. When you cut the noodles in, they sink, but they will float back to the top as they cook. Drain them in a colander and rinse them in warm water to help prevent sticking. See pictures below to get a visual idea of the process. Now turn back to your chicken and sauce. Turn the burner back on and get a little simmer going again. 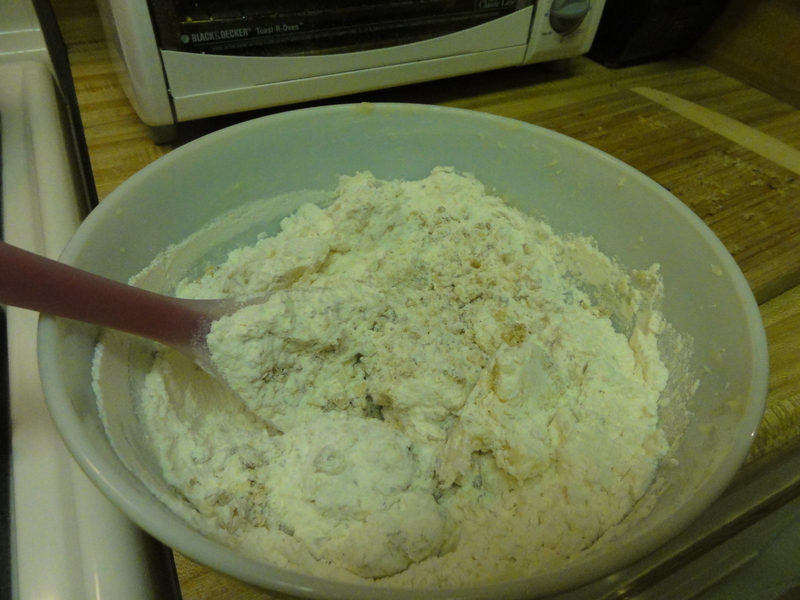 In a small bowl, mix the flour and ½ and ½ . Add to the pan and stir it in. 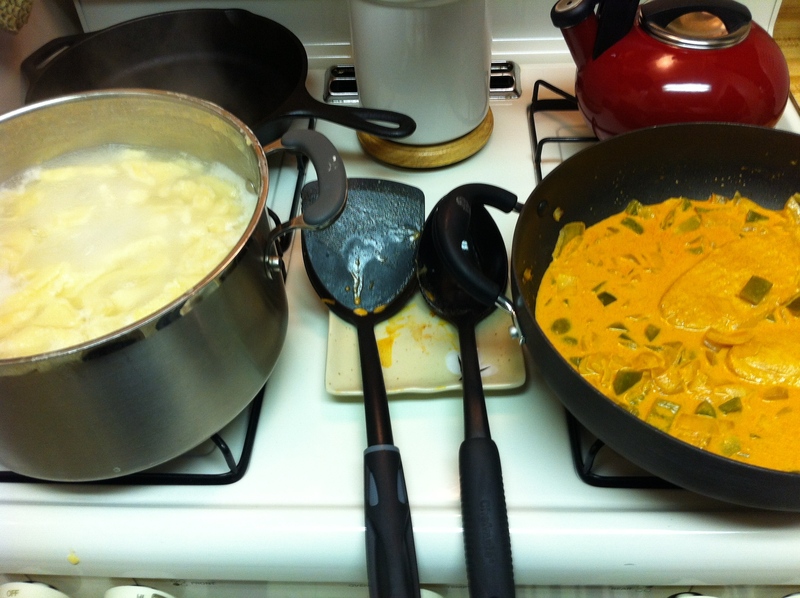 Let it heat and thicken a little and serve hot over the noodles. 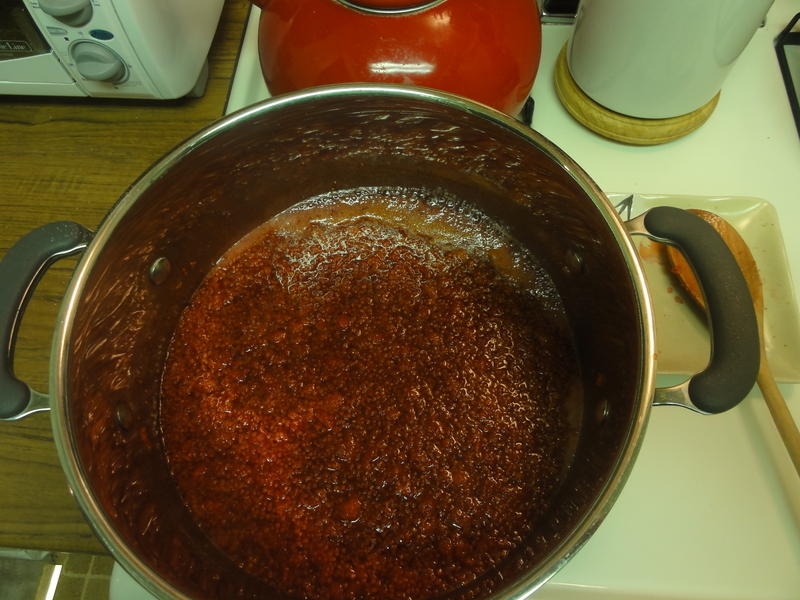 DON’T LET THE SAUCE BOIL ONCE THE ½ AND ½ MIXTURE IS ADDED. That will just make it curdle and be gross. One final note: it is best to dish the noodles and then put the chicken and sauce over the noodles. This way everyone can add as many noodles as they want, and then IF there are any leftovers they can be stored by themselves. If you mix the noodles into the sauce and store them like that, they will get soggy. This dish is great re-heated and had for leftovers the next day. Also, the best way to mop up any remaining sauce on your plate is with a piece of sliced bread! 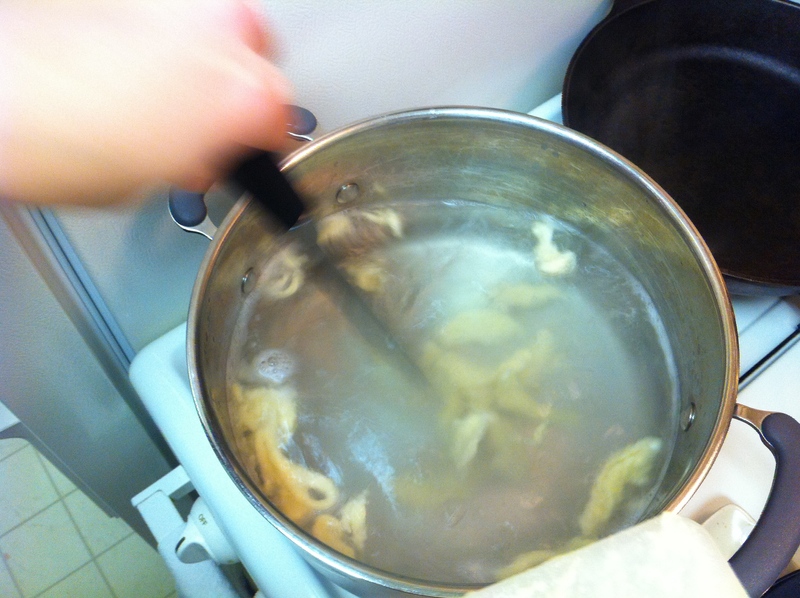 This is me in college, beating noodle dough for chicken paprikas. This is exactly what I had to do this time as well. 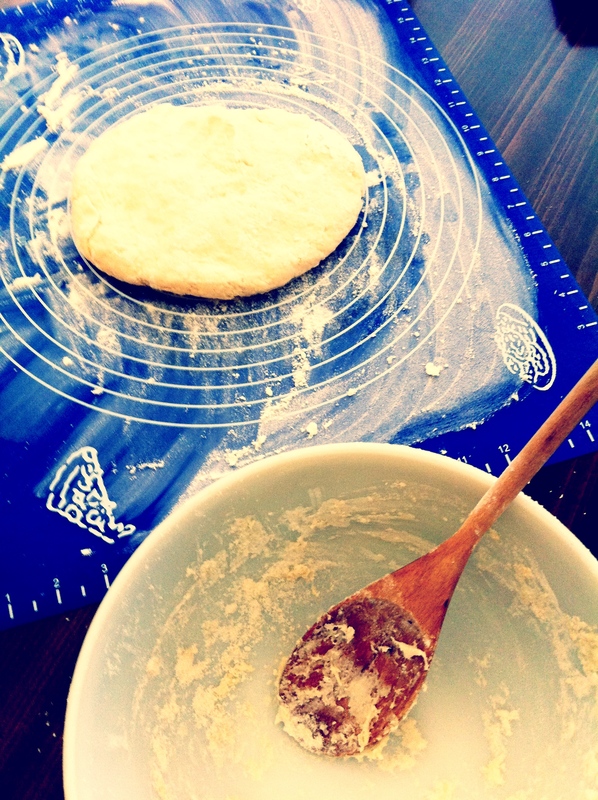 The floor and your knees are helpful aids in beating dough! I finally got a reader (or is it “eater” in this case?) request! My cousin Jon’s beautiful new wife, Tracie, recently discovered The Wooden Spoon (thank you to whoever in the fam is sharing- I don’t have everyone’s email addresses!) 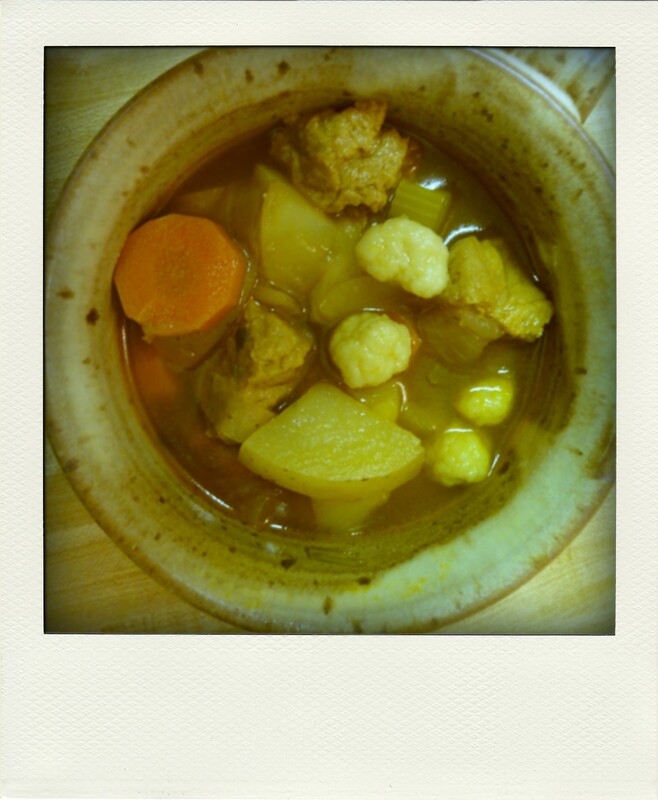 and adventurously made Goulash with her Mom for Jon. Apparently he was very happy to come home to a Hungarian meal, Grandma-style, and wanted to know if I had the recipe for a “bean soup that Grandma used to make” that may have had sour cream in the broth. 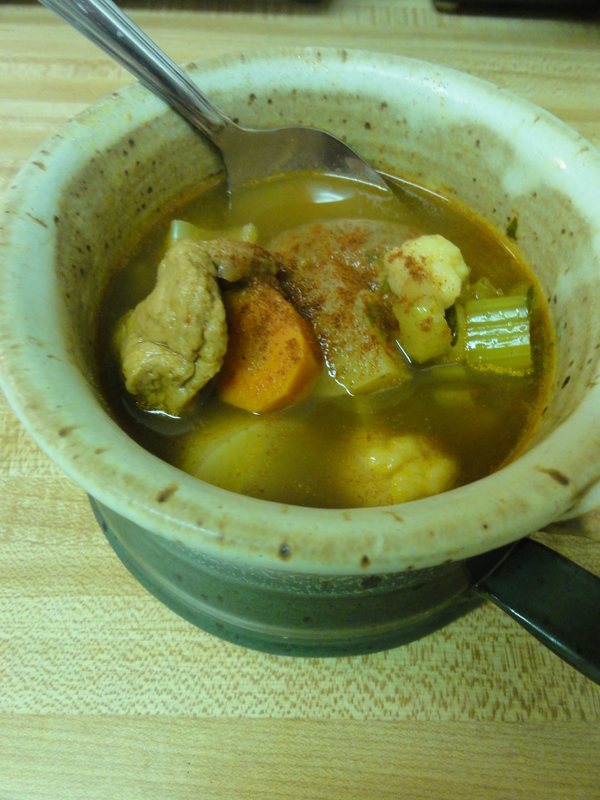 Well there was only one bean soup that he could have been referring to, and I had been contemplating making it for several weeks, so here it is: Bab Leves! The soup, pronounced “Bub Lavesh”, is very simple, easy, creamy, and warm. 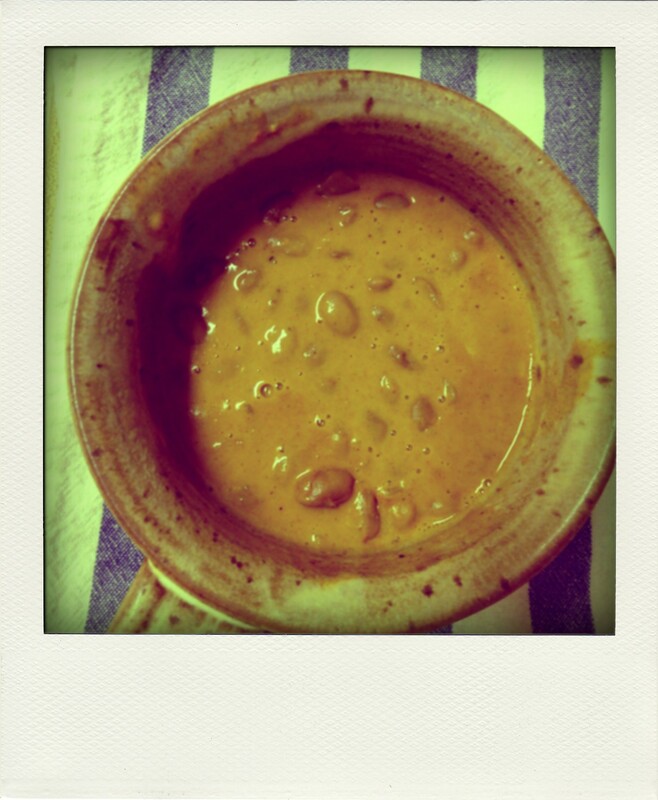 Of course, being that it is bean soup, it is also very bean-y. 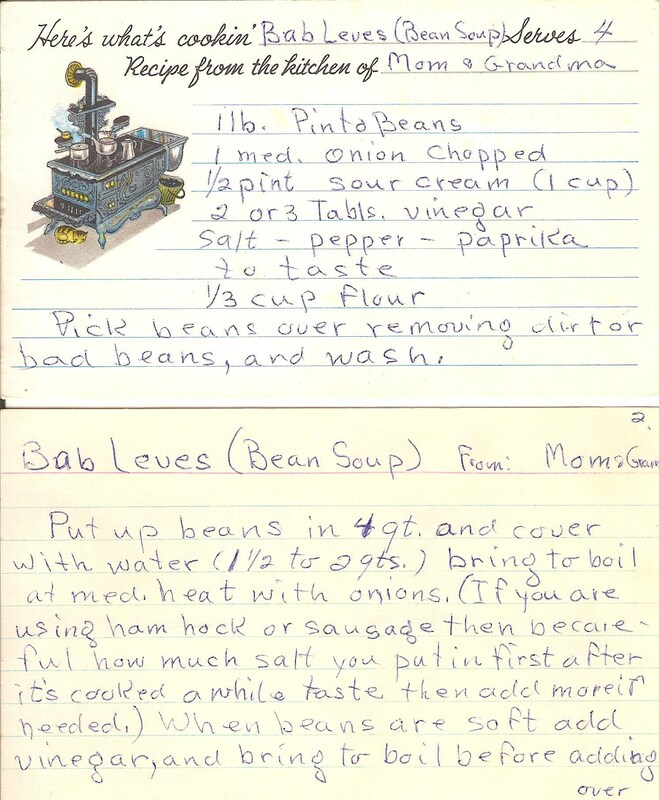 I had heard all about the deliciousness of Bab Leves from my Dad, but I had never actually made it or had it before. Grandma knew her core of Hungarian recipes by heart. She did transcribe her recipes for the record, but they are not always very thorough. Each recipe is like a little story, and at the end of the story you may feel like you missed a chapter or two. However, Hungarian recipes and cooking are traditionally passed on via cooking together with your mother or grandmother, and she made sure all of her daughters-in-law knew how to cook Hungarian, and some of the grandchildren also got to learn from her and eat her cooking. It’s a running joke (that’s kind of true) that my Mom had to learn to cook Hungarian in order to marry my Dad. I learned mainly from my Mom, and also rely on my Dad’s intimate knowledge of how these recipes should taste and how Grandma made them. This has been a very long-winded way of explaining that I was nervous about making a recipe I had never made with my Mom or eaten with my Dad, and furthermore making it solely using Grandma’s recipe card. How would I know if the taste was right? Especially with omitting the meat! It looked easy enough though, and it was. Grandma actually takes care of the vegetarian issue with this recipe (proof that she would have no problem with this vegetarian Hungarian food I’m making! ), telling my Dad (Bobby) that he could just add some oil and garlic if he wanted to make it vegetarian- “tastes just like ‘kolbasz’ flavor sausage!”- and that worked well for me. I don’t know if it really tasted just like sausage, but it sure tasted good! I might use even more garlic next time. Grandma’s recipe calls for several tablespoons of vinegar, but my Dad later told me it was really “to taste”. Apparently, my Grandpa Zoltan used to sit down with a bowl of Bab Leves and a bottle of vinegar and just go to town! I think I personally like less vinegar, but it’s totally up to you! 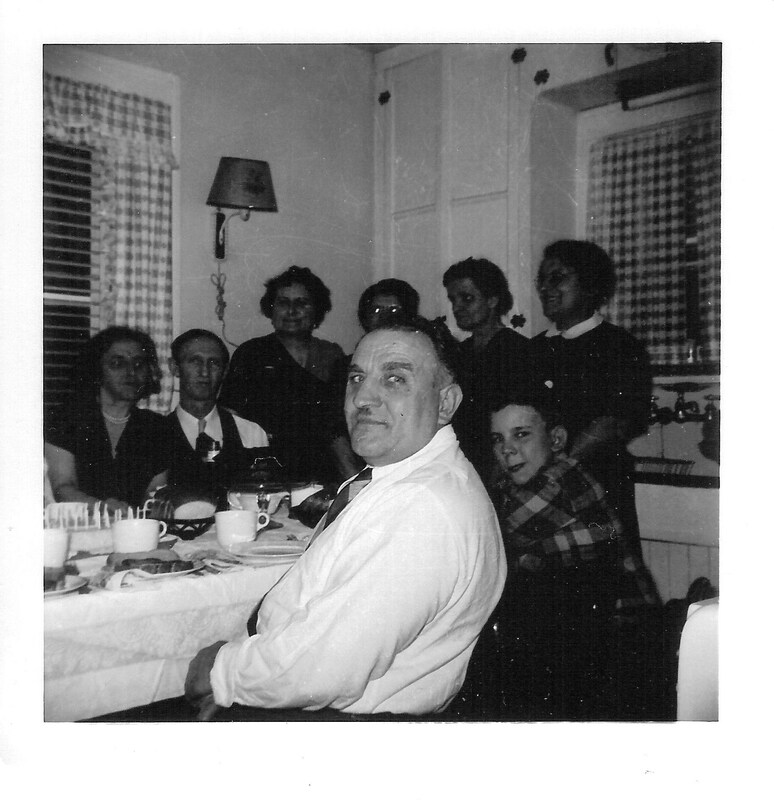 The man in the forefront is my Great Grandpa Szabo, my Grandma's father. I wonder if he was sitting down to a bowl of bab leves? My parents were just in Baltimore, visiting for Thanksgiving, and my Dad got to try my Bab Leves. He said it definitely tasted right, which was a relief because even though I thought it was good, I wasn’t 100% sure that it was right. The only caveat he had was that it needed something else to replace the sausage that was normally in it, so next time I will experiment with adding veggie sausage. But at least for now I can confidently share this recipe with you, knowing it lives up to Grandma’s standard. I hope that it tastes just like Jon remembers it, and I am so happy that his wife and their boys (the adorable Karson and Konnor) get to learn Grandma’s recipes and have some real traditional Elek family food! Pick beans over, removing dirt or bad beans, and wash. Follow the instructions on the bag the beans came in, doing a quick or overnight soak (Misha says overnight works best). Saute the garlic and onion in olive oil in a large pot over medium heat, just until the garlic starts to brown slightly and the onion becomes transparent. 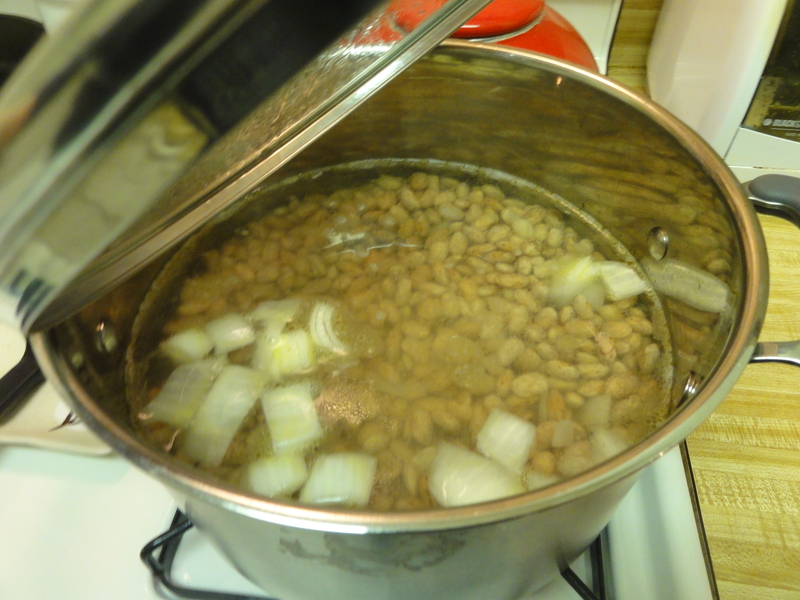 Add the beans and enough water to cover, about 2 quarts, and bring to a boil. Let boil for about 45-60 minutes, or until the beans are soft. While the soup is cooking prepare the sour cream mixture. In a medium bowl combine sour cream, flour, and paprika. Mix smooth and set aside. 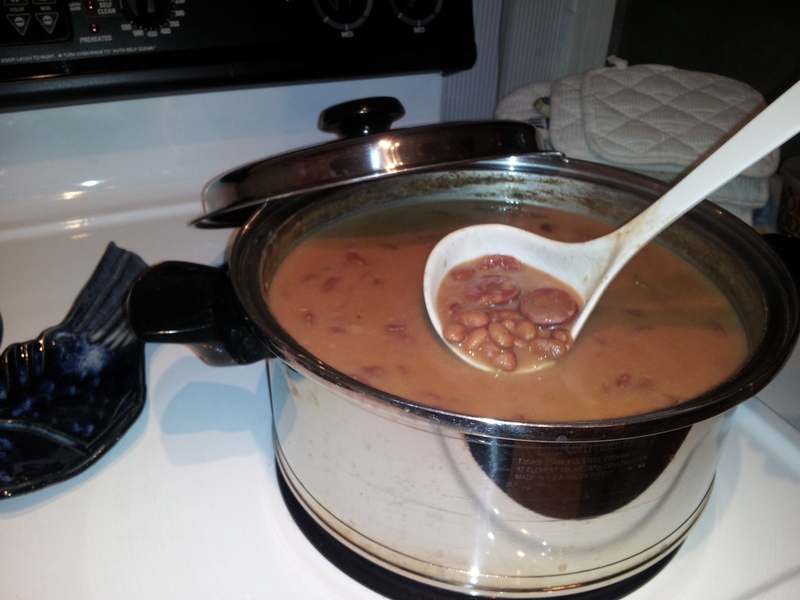 When the beans are soft, add vinegar and let come back to a boil. Once boiling, add a couple dippers of soup to sour cream mixture and combine well. Now add to the soup pot and stir, let come to a boil one more time, and shut off. This soup can be made with green beans instead of pinto beans. It is best served with salt, pepper, and maybe a bottle of vinegar. Our recent trip to the Maryland Renaissance Festival, plus the gorgeous cool fall weather rolling in, combined with my not-so-gorgeous fall cold, has got me on a serious soup kick. It’s been weeks, and soup is all I want (the cool new soup bowls we picked up at Ren Fest aren’t helping the matter). Of course, the best most comforting soup in the world- especially when you’re sick- is chicken noodle, and I think Hungarian Goulash is like chicken noodle soup on crack. It’s more of a hearty stew, and it still has the traditional onions, carrots, and celery; but instead of “chicken” it has “beef” (which in the imitation meat world are more or less the same thing, but I digress…), instead of egg noodles it has noodle-y dumplings, and on top of that, it has POTATOES and lots, lots, lots of PAPRIKA. Could anything be more delicious? The answer, my friends, is no. It is supreme deliciousness. And best of all, it is easy to make. So far, all the traditional Hungarian recipes I have shared with you have involved making tricky pastry dough, and may have been mildly intimidating. But there isn’t any pastry dough here, just some simple noodle-dumplings. That’s the hardest part, and it’s not hard! I seriously encourage you to try this recipe TONIGHT. Not tomorrow night, not next week- TONIGHT. I am so happy with how it turned out that I did a little jig. I think Grandma would have been proud. This also happens to be one of the first recipes I have ever created myself, and I think that in itself is cool. The fact that my vegetarian version of Goulash tastes fairly authentic is even cooler. In the Hungarian recipe book, A Taste of Hungary, it says that “These recipes have not been laboratory tested, but their merit has been approved by the most critical of groups- HUNGARIAN HUSBANDS.” I do not have a Hungarian husband, but I do have a first generation American-born Hungarian father. So now I just have to wait until November, when my parents visit, for the true test: feeding this vegetarian version to him! Last but not least, I humbly ask you for your honest feedback on this recipe. Tell me what you liked; tell me what you would change. Tell me how it compares to meat Goulash. Tell me if the directions were easy to follow. Tell me EVERYTHING! Misha and I felt that the texture of the seitan might be a bit off for this dish, and that maybe next time I should try making it with Lightlife’s Seasoned “Beef” Strips. I felt that it could use double the amount of dumplings. Misha added the smoked sea salt and it really brought out a meatier flavor. Just please share anything and everything you think with me, and together we can perfect this vegetarian Goulash! In a large pot, sauté the onions in olive oil until transparent. Add the seitan, along with any juices that are in the packaging. 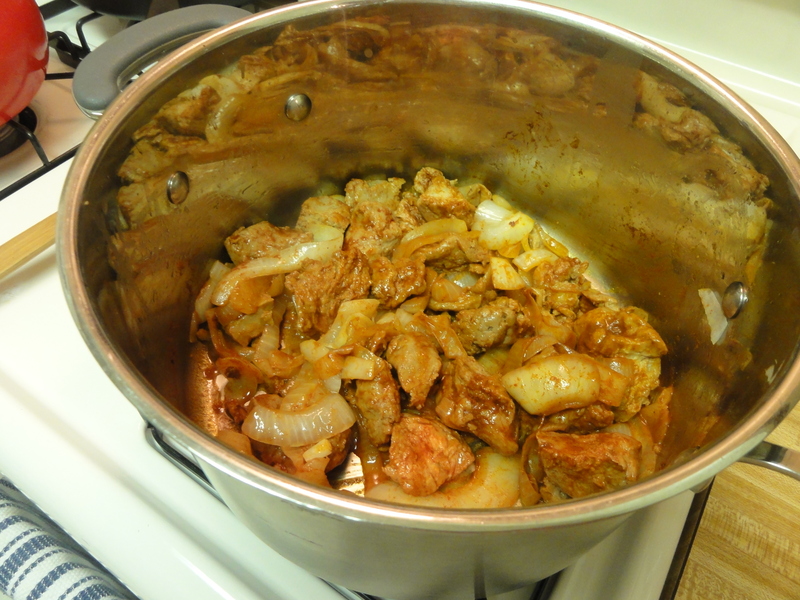 COVER the onions and seitan in paprika- be generous- the more paprika, the better. Add about a half a cup of water and let simmer for 3-5 minutes. 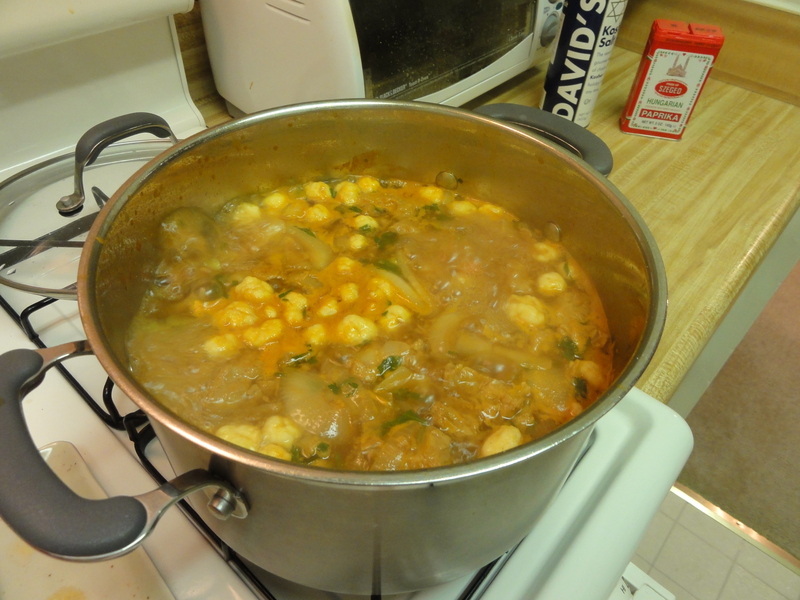 Add the vegetables, the parsley, 2 quarts of water, and 3 tablespoons of bouillon, stirring everything together. Turn the heat to high, cover, and let come to a boil. While the pot is heating, make the dough for the noodles. Beat the egg and salt together in a medium size bowl. 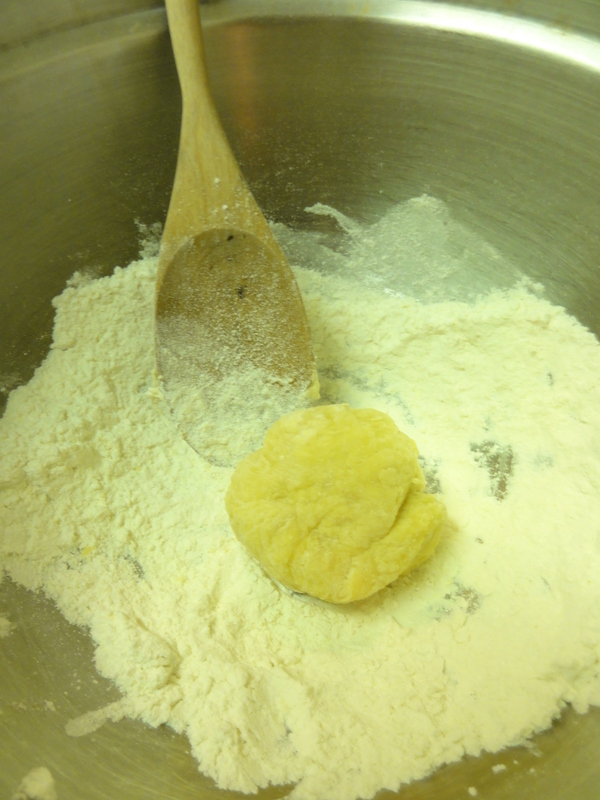 Start adding flour, beating in between, until a solid dough forms. 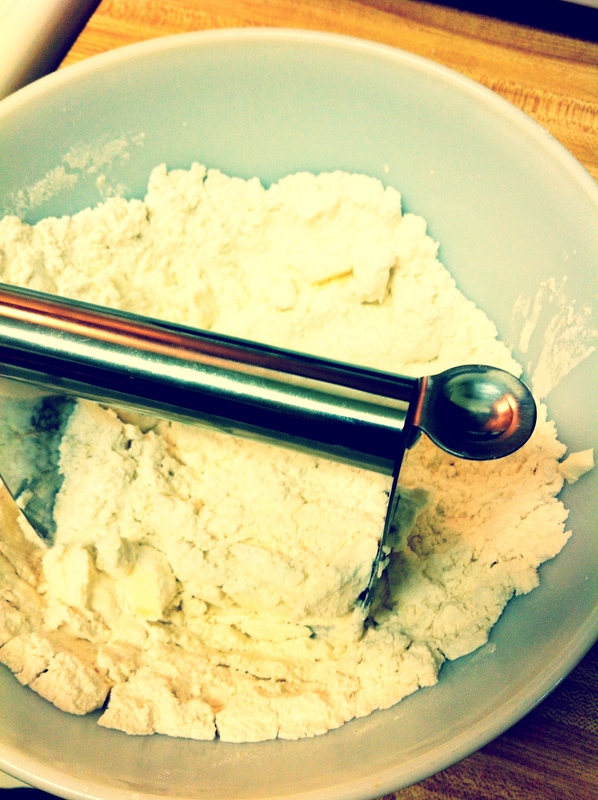 Keep adding flour until you can handle the dough without too much sticking. Once the pot has come to a boil, start pinching small pieces of dough off, rolling them into little balls, and adding them to the pot. They should be about the size of your fingertip. Keep adding them until you run out of dough. Cook slowly until the noodles/dumplings taste done but not mushy. Add smoked sea salt (or regular salt if you can’t get the smoked variety) and pepper to taste. Store leftovers in the refrigerator- tastes even better the next day! 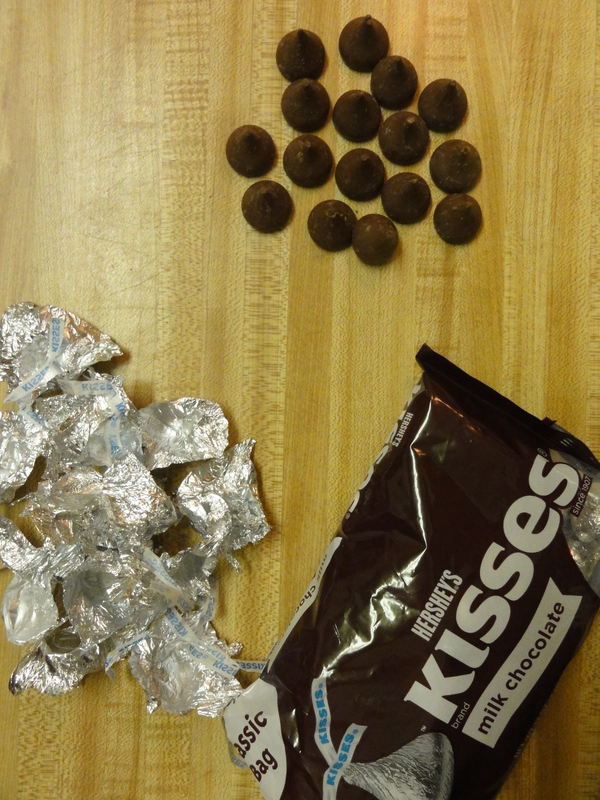 Ok, time to come clean: I, Sarah Elek, have an enormous sweet tooth. Courtesy of my beloved Dede, my mother’s mother, I crave sweets after every meal and always make sure I leave room for them. 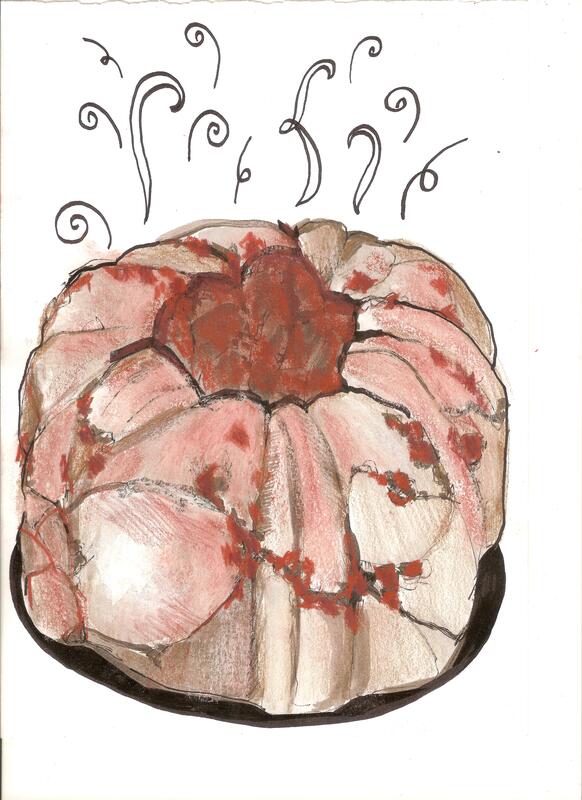 It appears that Dede was not the only one who I inherited my sweet tooth from- the overwhelming amount of pastries and desserts in my Grandmother’s recipes leaves no doubt as to her penchant for sweets. There are just so many incredible Hungarian delicacies featuring sugar that it can be hard to remember to make something savory. My Dad reminded me that I should be making Trapacska and Paprikas, but these are heavy dishes, much more suited for winter and not the 100 degree weather we’ve been having. 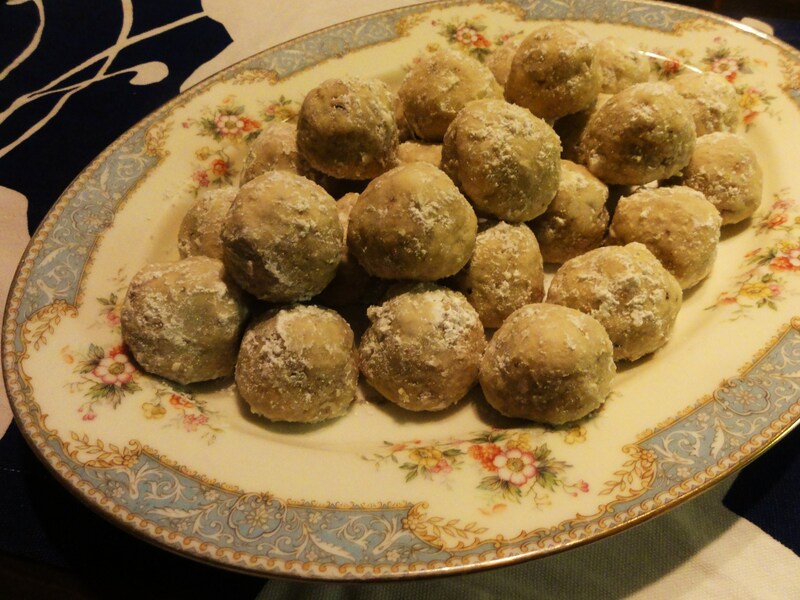 So for this post I made a recipe that is not exactly Hungarian, but is one of my Grandmother’s nonetheless and incredibly delicious. It is savory, not too terribly heavy, and even incorporates a little sour cream- one of the key ingredients to any Hungarian dish. Best of all? I finally get to introduce you to some vegetarian protein! Many of you may have had some version of Chicken and Broccoli Casserole before. 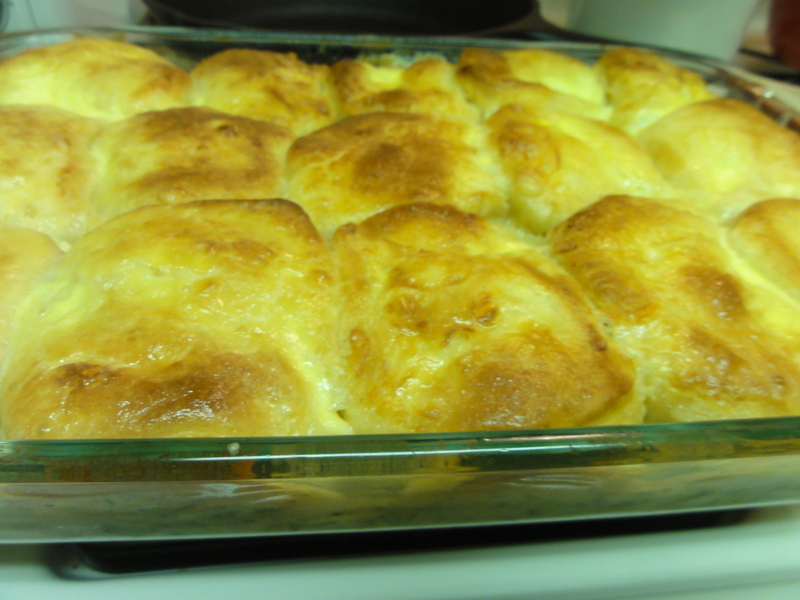 It is a classic dish, one of many, many casseroles to come out of the 50’s, and it smells like home and comfort and mom. Misha and I made Grandma’s version together one night, and tweaked it here and there. Misha felt that rice was necessary, we substituted cream of mushroom soup for cream of chicken soup, and of course being vegetarians we did not use chicken, but instead used a vegetarian protein made from mushrooms masquerading as chicken. It’s sold under the brand name “Quorn”. Quorn is fantastic because it is soy free and much more nutritious than other vegetarian proteins. I love that it’s made from mycoprotein (fungi, i.e. mushrooms)- the common saying, “tastes like chicken!” is very appropriate here. 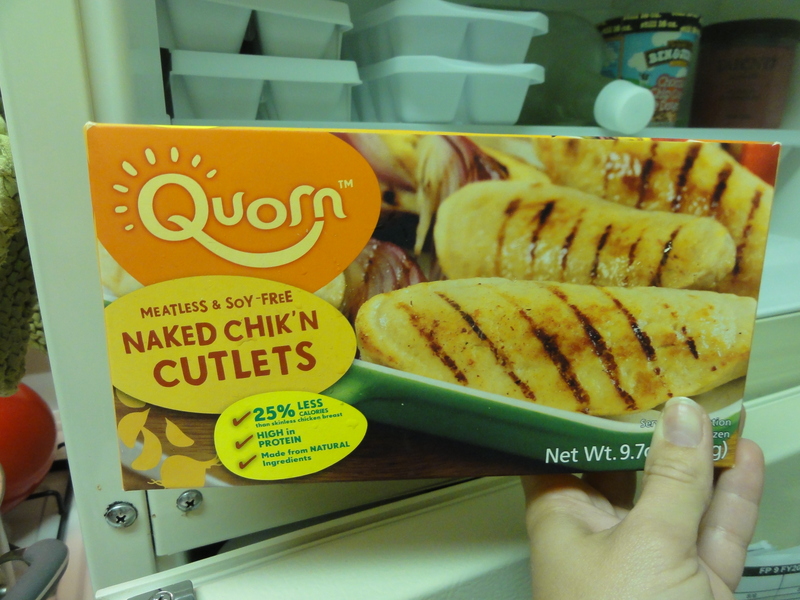 Quorn makes a lot of different products that are great for all sorts of dishes (their chicken nuggets are an awesome post-late-night-party snack), and we used their naked chik’n cutlets for our casserole, cut into cubes. Once blended in the casserole, you would never know it wasn’t the real thing! We were both a bit skeptical about the final step in the recipe- the “topping” Grandma calls it. 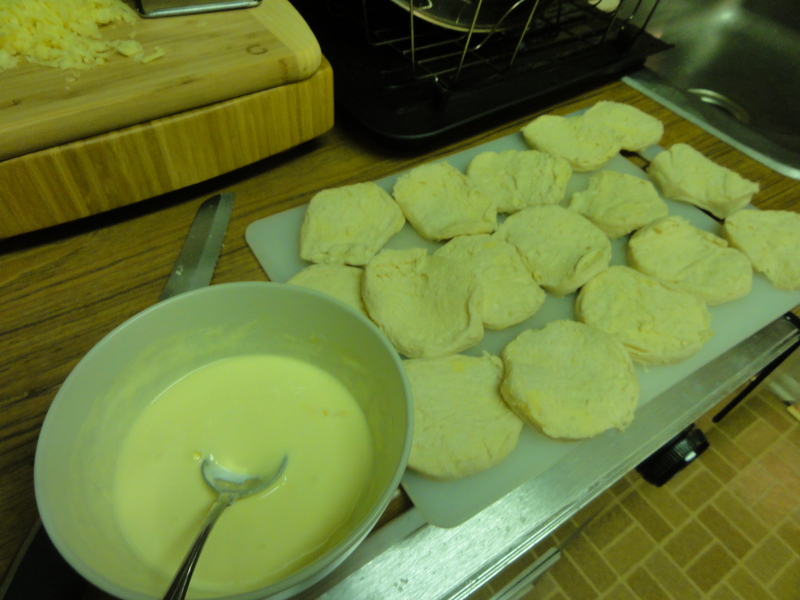 Grandma tells you to mix sour cream and egg and spread it over the biscuits right before the second stage of baking. I have brushed egg yolks on top of various doughs to give them a golden look at the end, but the last time I baked sour cream in a casserole it came out wrong and I was concerned the topping would come out wrong too. 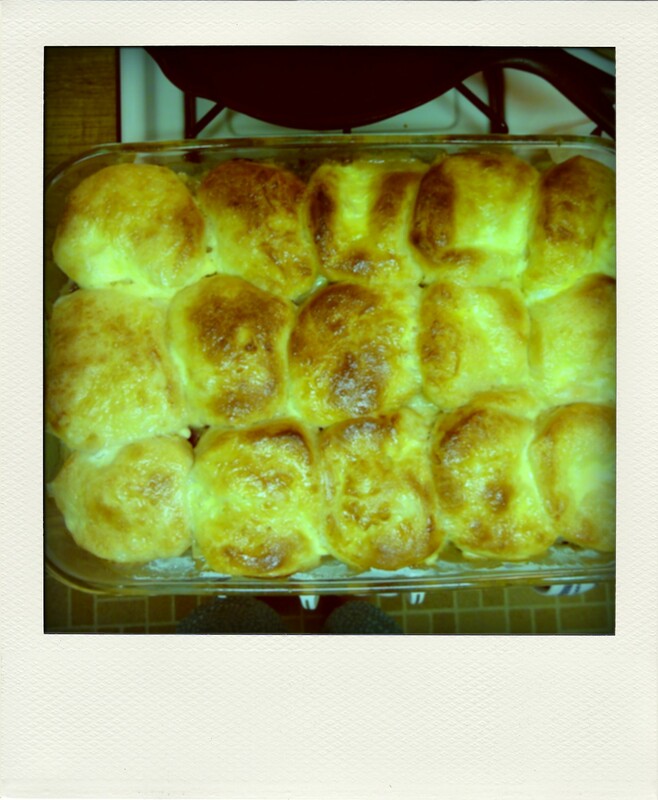 Again, my Dad intervened and said if it’s in Grandma’s recipe, it has to be good. 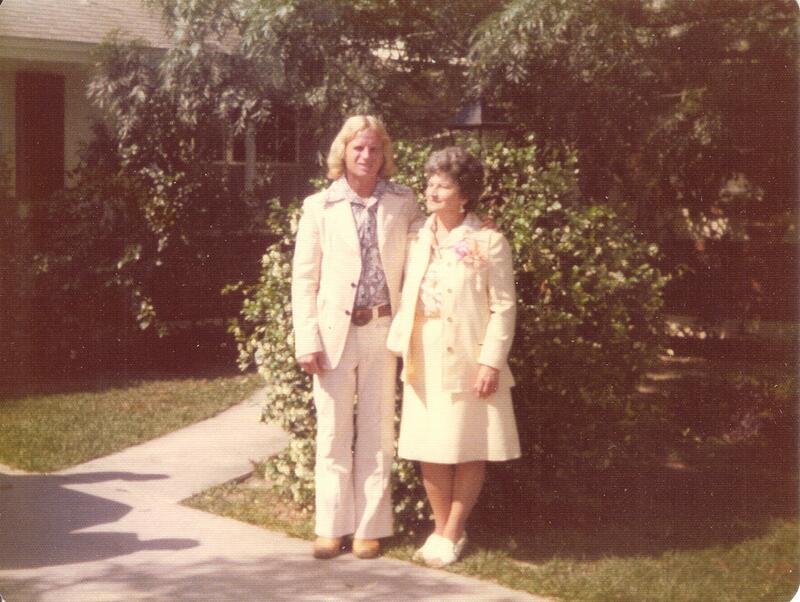 And of course, he was right- Grandma would never lead me astray, and it turned out wonderful. We loved it so much, and I’m sure you will too. Grandma’s Chicken and Broccoli casserole is a family-friendly and comforting classic with a Hungarian twist. Could that be any more delicious looking?! Preheat oven to 375. In a medium bowl, combine chicken, broccoli, soup, onion, mayonnaise, Worcestershire sauce, curry, and rice if you are using it. Mix well. If you need more liquid to thoroughly cover all the ingredients, add a little bit of milk. Pour mixture into ungreased 9 x 11 baking dish. Sprinkle with ½ cup of cheddar cheese and bake at 375 for 20-25 minutes, or until hot and bubbly. Meanwhile, separate the biscuits into 10 pieces and cut each biscuit in half. 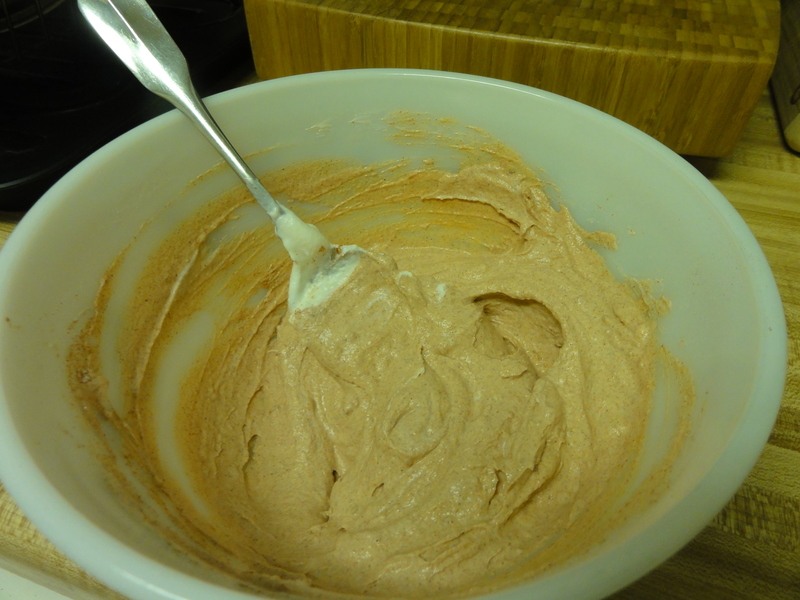 In a small bowl, whisk together the sour cream, egg, salt and celery seed if you are using it. Take the casserole out after the timer has gone off and arrange the biscuit halves cut side down on top of the casserole. 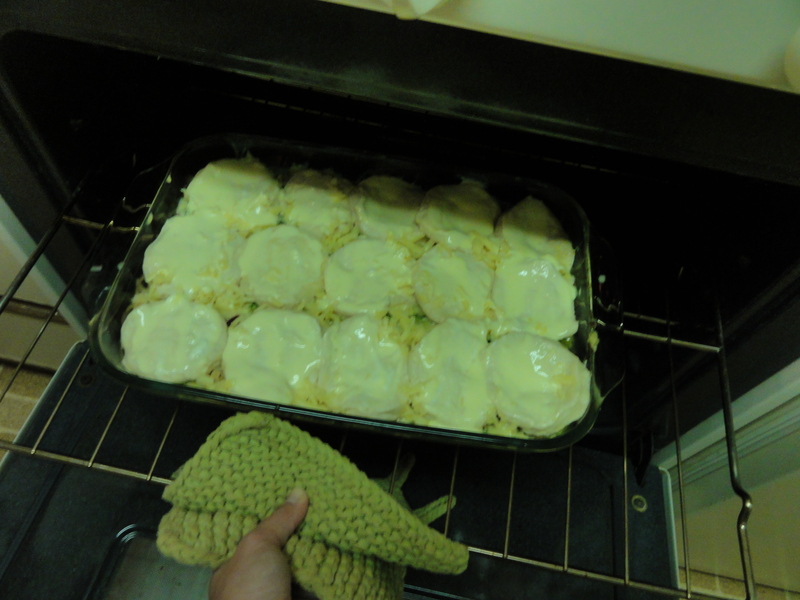 Add the last ½ cup of cheddar cheese. 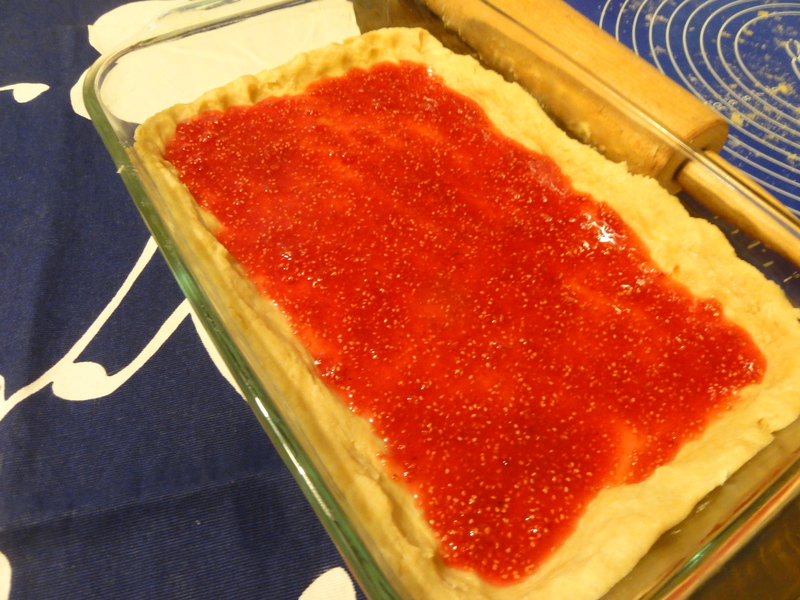 Using a spoon or knife, spread the topping over the biscuits. Return to the oven and bake for 25-30 more minutes, or until golden brown. Cut and enjoy! Store leftovers in the refrigerator. On a grey, rainy spring day, with Norah Jones crooning in the background, I set about making one of the most amazing coffee cakes ever. 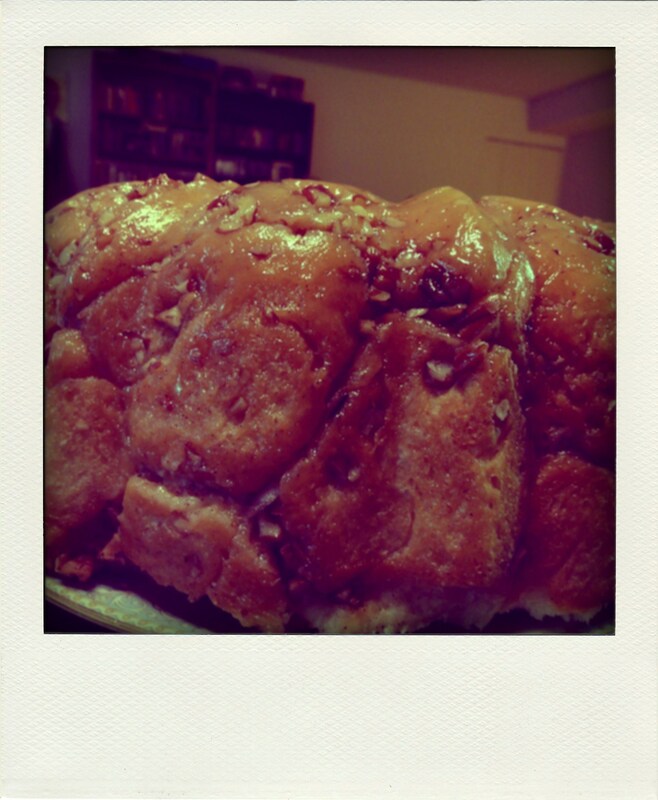 Technically it’s not really coffee cake, it’s more like monkey bread. It’s Arany Galuska, or Hungarian Sweet Dough. 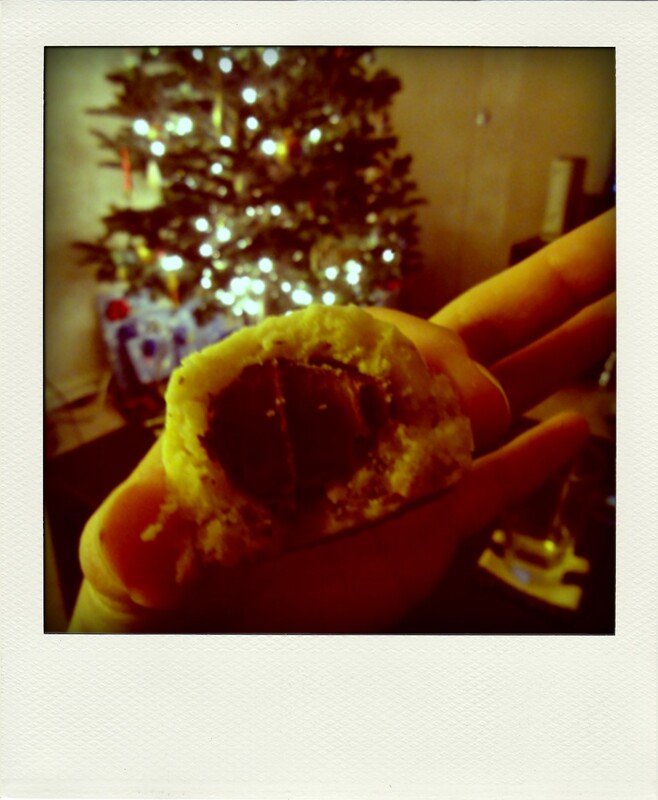 It’s made up of soft, melt-in-your-mouth dough dipped in butter, sugar, and nuts and then baked in a tube pan. 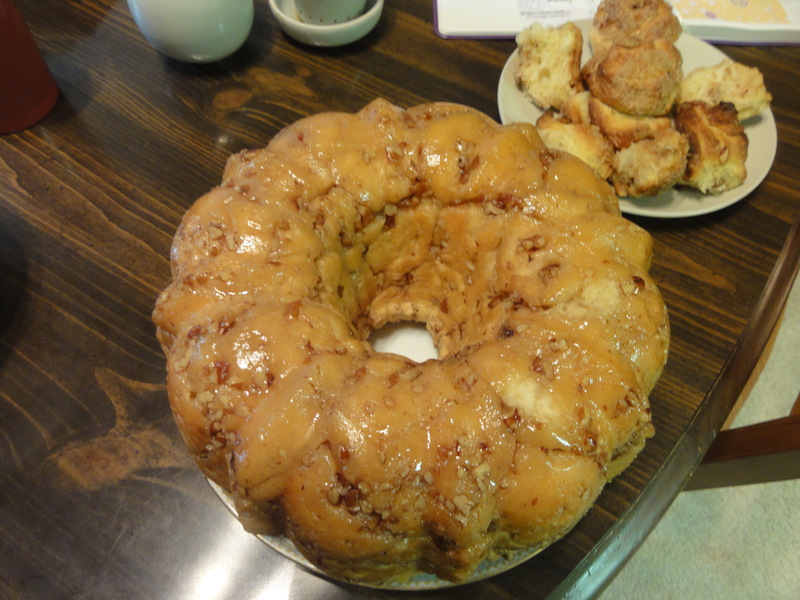 This bread/cake is perfect for breakfast, with hot tea or coffee, but I love to eat it at all times of the day- if it’s sitting around the house, I just have to have some. 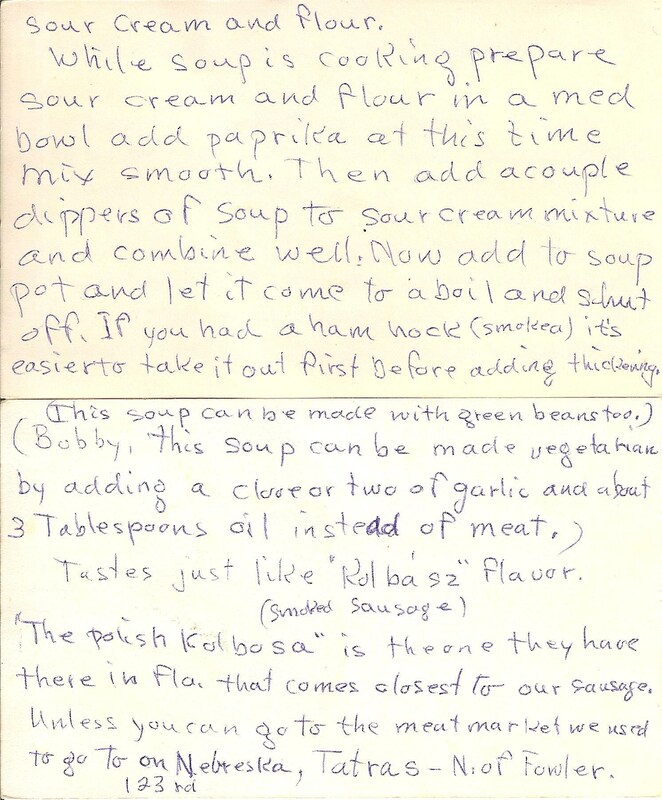 I had to spend a little time deciphering my Grandmother’s handwritten recipe. For example, I didn’t know how to “scald” milk, a term that was probably pretty common to her and which I easily found in Joy of Cooking– but I had never heard it before. Scalded milk is milk that has been heated to 82 C/180 F, the temperature at which bacteria and enzymes in the milk are destroyed. With the level of pasteurization in our milk today it’s not really necessary to scald milk much anymore, but I did it anyway to be true to the recipe- Grandma said it was needed “to make a soft dough”. 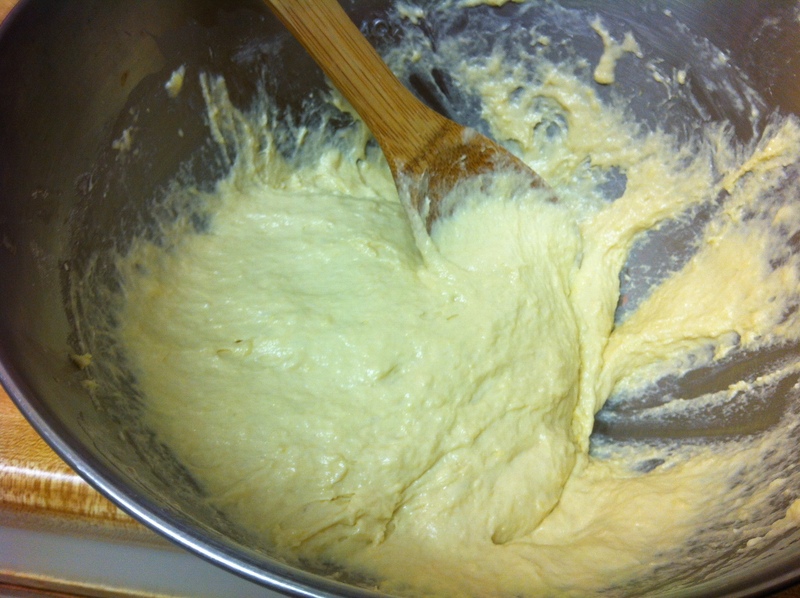 Dough in the early stage- see how sticky it looks? The next issue came during the “beating the dough” stage. 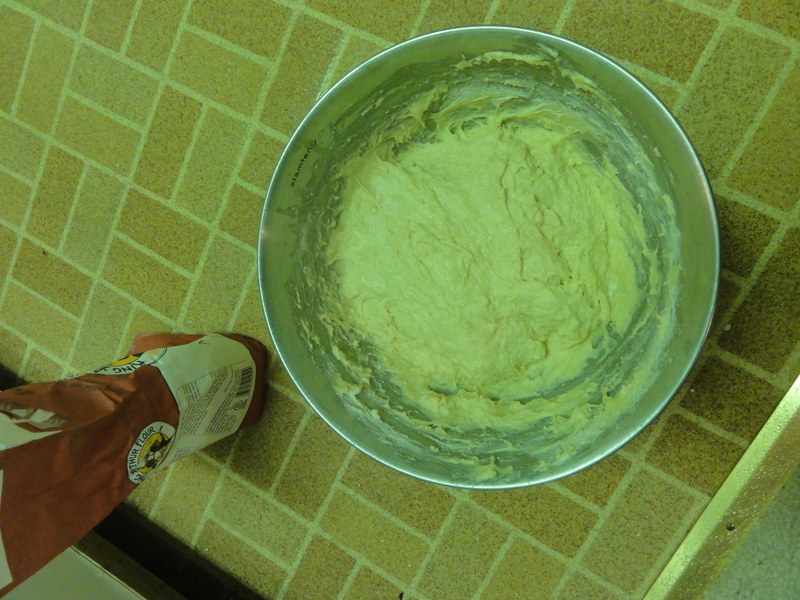 Once you’ve combined all of the ingredients with the flour you “beat until dough is smooth and leaves side of bowl”. Well I started beating, and the dough was JUST SO STICKY. In the recipe, Grandma says to have an extra cup of flour on hand “if you’ll need it”- I ended up using at least 3 extra cups! My Dad said, “Honey, you might have over done it”, but really I had no choice- I had to keep adding flour or the dough would never have left the side of the bowl. 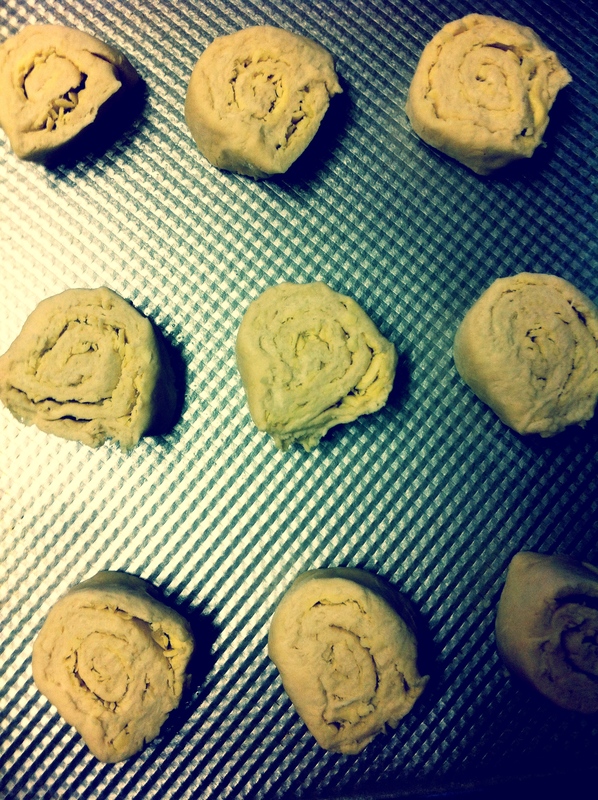 Even then I had to beat the dough for a long time to get it smooth. Norah Jones was singing, “Once it has begun, won’t stop until it’s done”, and so I just kept on beating until it was done! 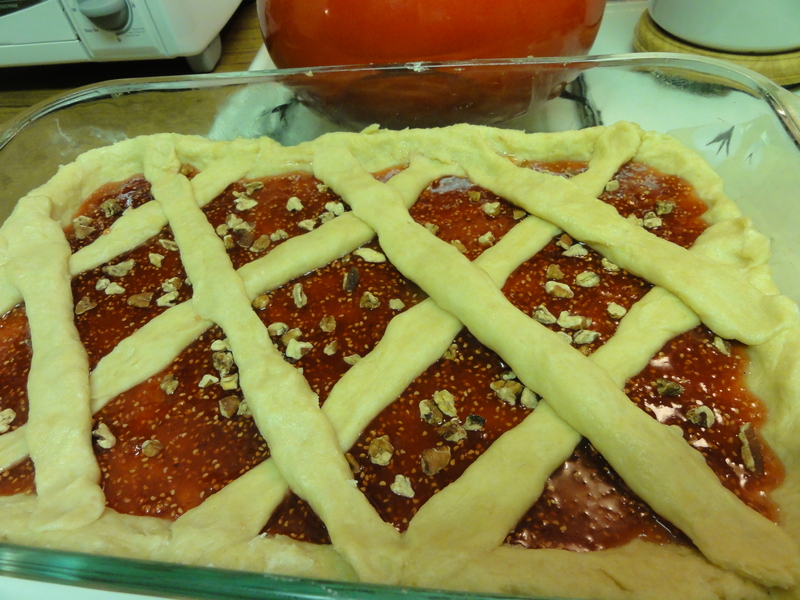 Once I put it in to bake, I was relieved and excited, hoping it would come out ok despite all the extra flour. However I had one more unforeseen challenge to overcome: I filled the pan too high and the butter started bubbling and dripping out the top, causing smoke to start filling my apartment and setting my fire alarm off! So I had to stand there and fan my fire alarm till enough smoke had evaporated that I could safely leave and run the Arany Galuska half-baked across the street to Misha’s sister Jacoba’s apartment to finish baking it there (with a pan under it this time, of course). And after all that, it turned out PERFECT. The dough couldn’t have been softer or sweeter. I highly recommend you make this recipe ASAP and enjoy it during your next Sunday brunch! Cover the dough in the bowl with oiled wax paper and a towel and let rise in a warm place (the oven is a great place to let dough rise- just don’t forget it’s in there and turn it on!) till double in size- about 1 hour. In the meantime, “get your nuts ground & butter melted”. Melt butter in the microwave in a small bowl. In a separate bowl, mix finely chopped nuts and sugar. When the dough is ready, put out on lightly floured board (I kept mine in the bowl) and keep warm with a towel. Pull some off and start cutting into small rounds “about the size of a whiskey glass” (To me, that might be a bit big- I think she means a shot glass). 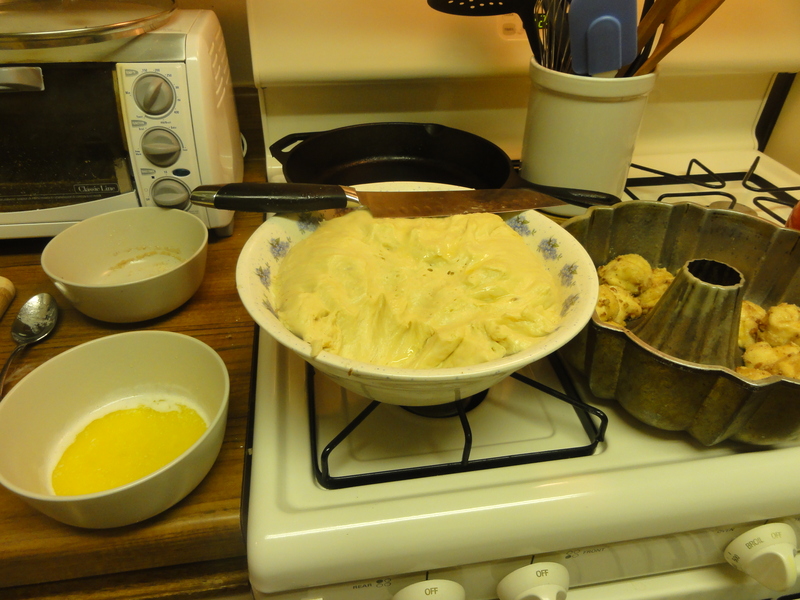 Dip the rounds into the melted butter, then into the nuts and sugar. Place into ungreased tube pan (I used a fluted bundt pan and greased it a bit, but really the greasing is not necessary- I was just worried it would stick since the bundt pan I was using wasn’t nonstick) lightly, not too close, then keep putting layers in until half full (I filled it all the way- probably why it overflowed). Cover and let rise in a warm place until double in size (mine didn’t rise too much the second time). Place on shelf in oven a little below half. Bake at 350 for 40-45 minutes till nice and golden. Let cool in pan- make sure you eat at least one warm piece!- then turn out on a cake dish and enjoy! 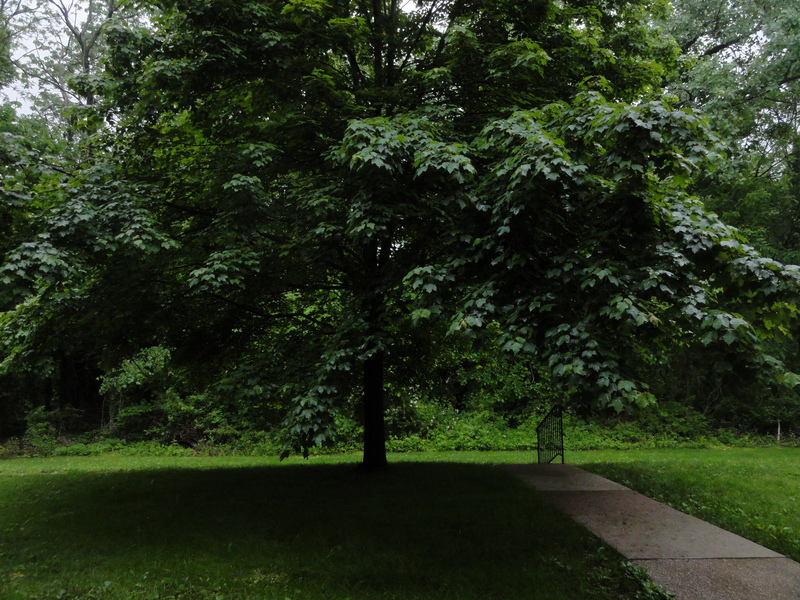 We are very lucky, because Misha’s parents’ property out in Reisterstown, Maryland is FULL of wild raspberry and blackberry plants. Every year the prickly bushes become laden with hundreds of small, sweet, juicy berries just waiting to be picked. Everyone in Misha’s family is more than willing to oblige the berries and pick as many as possible in the few short weeks that they are ripe and ready. Even better, Misha’s Mom cans the berries, making this incredible wild raspberry jam that is better than anything I have ever bought at any store. Wild raspberries have a slightly different flavor than store-bought raspberries- more juicy, more tangy, more sweet. Canning is a process that has always intimidated me. I think it’s because of the step that involves boiling jars in water, or the part about possible botchulism, or just the entire unfamiliar nature of the whole thing. Furthermore, I didn’t know what supplies I needed, or how to sanitize them, and the directions usually just confused me more. Canning was something my Grandmother did all the time, right out of her own garden in the backyard. 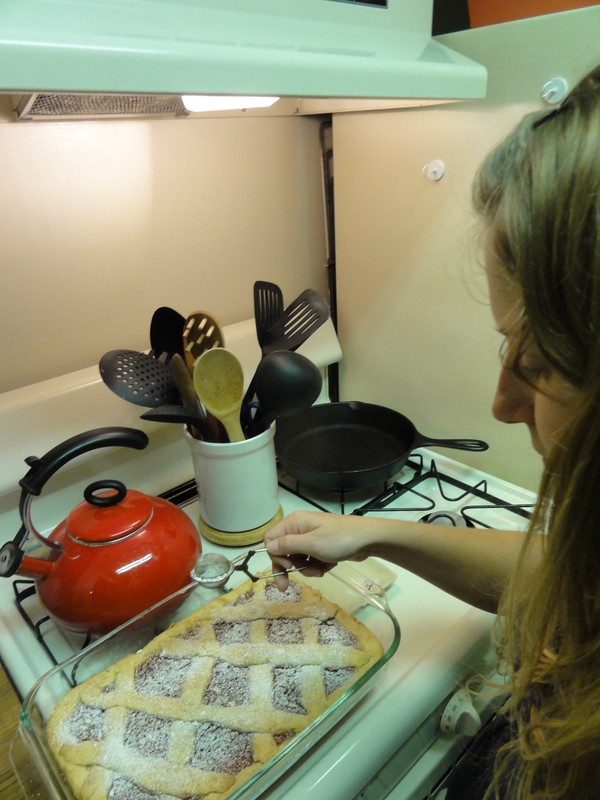 Many of the jams she used for cooking and baking were made by her own hand. Women (and men!) 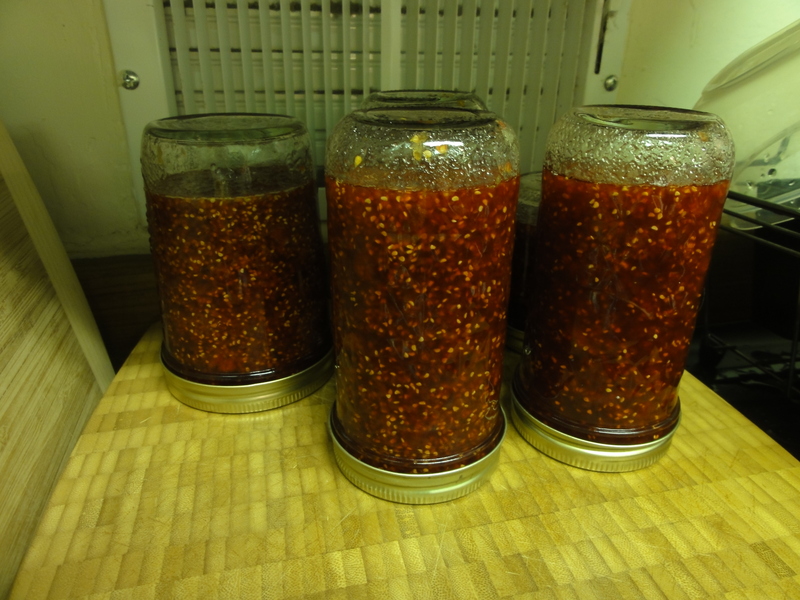 have been canning as a method of food preservation since the 1800’s, and if Grandma could do it, I could too! 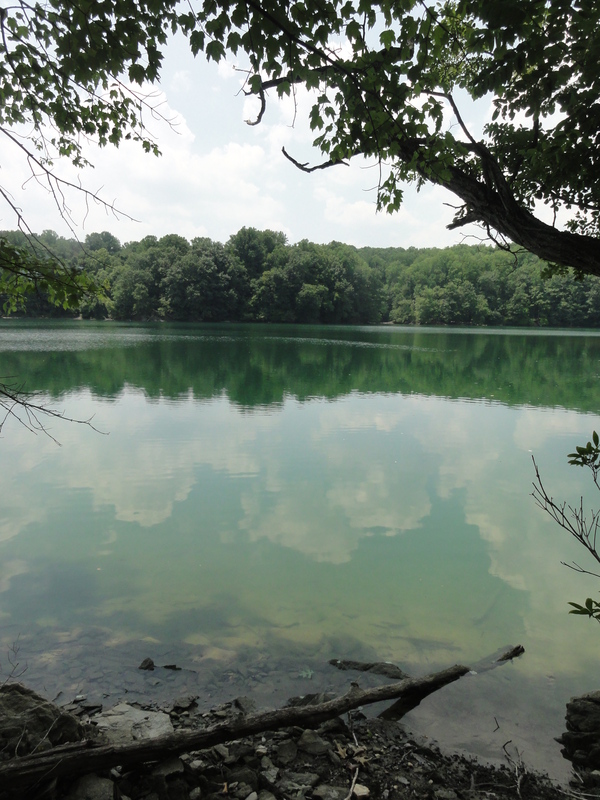 As it turns out, all I needed to tentatively test the canning waters was a canning “spiritual guide” of sorts. Enter Misha’s Mom, Candie. Last year, I picked berries with her for the first time and she held my hand and taught me how to make jam from them and can them. As it turns out, making jam is one of the easiest canning recipes you can try. Really! You don’t even have to boil the jars, and the berries are acidic enough that botchulism isn’t a concern. 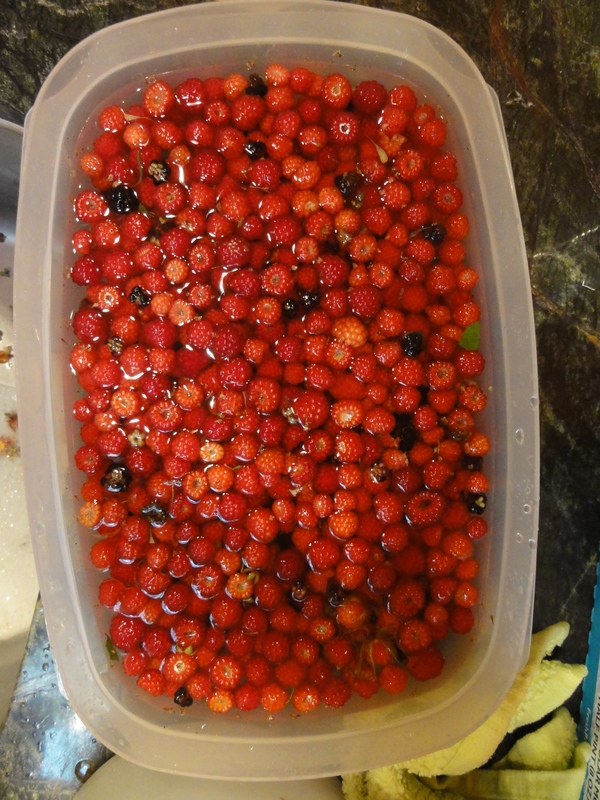 This year, Misha and I went canoeing on the lake behind his parent’s house, and then picked 2 ½ quarts of berries. I canned them at home, by myself, for the first time. The hardest part is just having everything ready to go at the right moment- there are a lot of little steps. 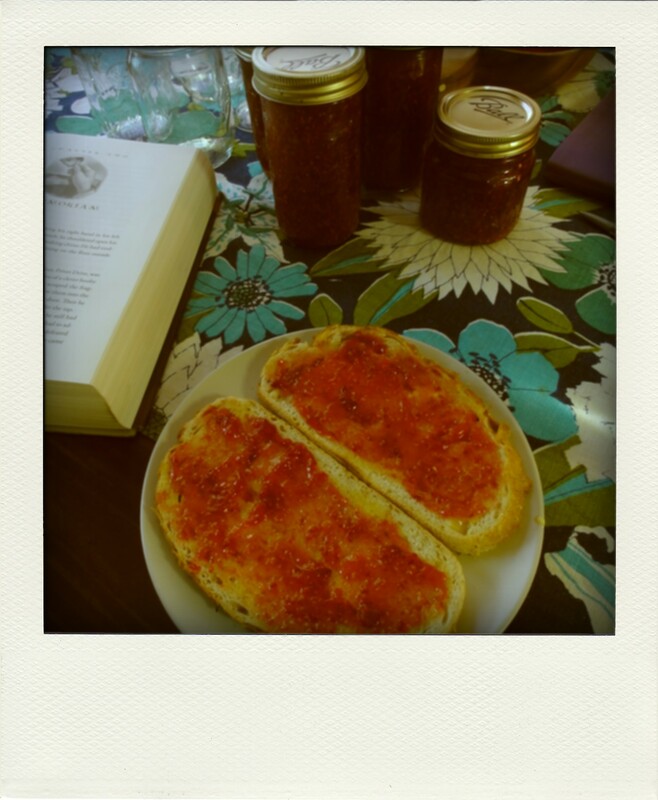 I was very happy and relieved when everything went smoothly and I was rewarded with 5 jars of wild raspberry jam. I encourage you to try this process sometime, maybe with an adventurous friend or your own canning guru. You don’t need access to wild raspberries, you can buy berries at the farmer’s market or in the grocery store, or you can even try canning something different. Just make sure you follow the recipe and directions that come with the type of pectin you buy. 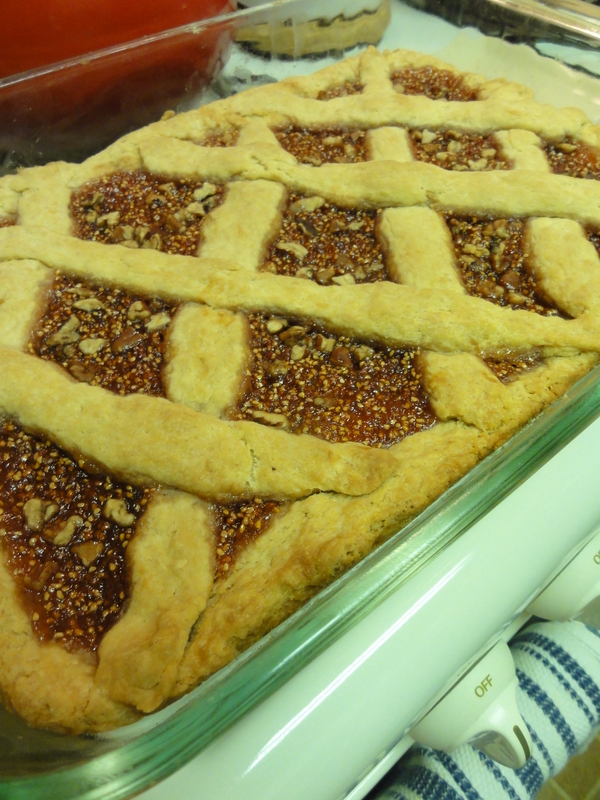 Afterward, go make some kifli with your new jam! Happy summer, and happy canning! After you have picked or bought your berries, you must clean the berries. There cannot be any green or brown stuff whatsoever in your berries. The best way is to get a big container and fill it up with water and pour them in there. The green and brown stuff will float to the top and you can pick it all out. Once they are clean, you want to measure your berries so you know how many you have. This is important because you will be following a recipe that calls for specific amounts of berries. Once you’ve measured your berries, put them in a large bowl and crush them. A potato masher works well for this step. Put on a teapot or regular pot of water to boil. 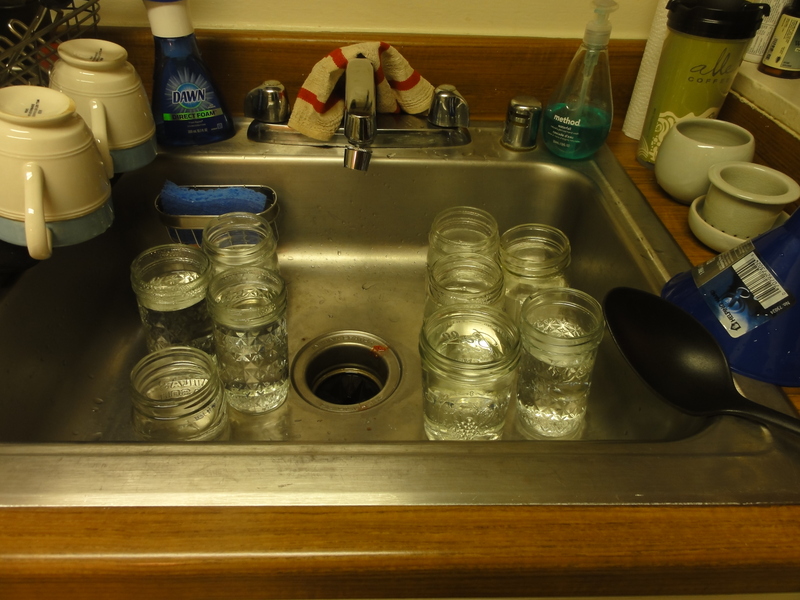 Wash your jars and arrange them in the sink. When the water boils, pour some in each jar so that they are hot when you fill them with jam. Place lids in a small pan and cover with water. Place on the stove and bring to a boil, then turn off heat and let them sit in the hot water. Follow the recipe and instructions that come with your package of Sure Jell, Certo, or Pomona’s Universal Pectin. This will tell you how many berries you need, how much sugar you need, and what steps to take to boil your berries and make the jam. For example, with Pomona’s, one recipe of raspberry jam calls for 4 cups of berries and ¾-2 cups of sugar, along with the pectin powder and calcium water that comes with the package and makes the jam jell. Since I had about 10 cups of berries, I changed the amounts, so instead of 4 cups of berries and 2 cups of sugar, I had 10 cups of berries and 5 cups of sugar. Instead of 2 tablespoons pectin powder, I used 5 tablespoons pectin powder. You get the idea. Once you’ve followed the steps in the recipe and completed the jam, pour the hot water out of the jars and set up your supplies next to the stove: jars, funnel, ladle, fork, and wet clean cloth. Place the funnel in the jars one at a time and slowly ladle the hot jam into each jar, filling the jar until the jam is ¼” from the top. Use the wet clean cloth to wipe any spilled jam from the rim of the jar. Using your fork (you might need two forks), carefully lift the hot lids one at a time from the pan and place on top of your jars. 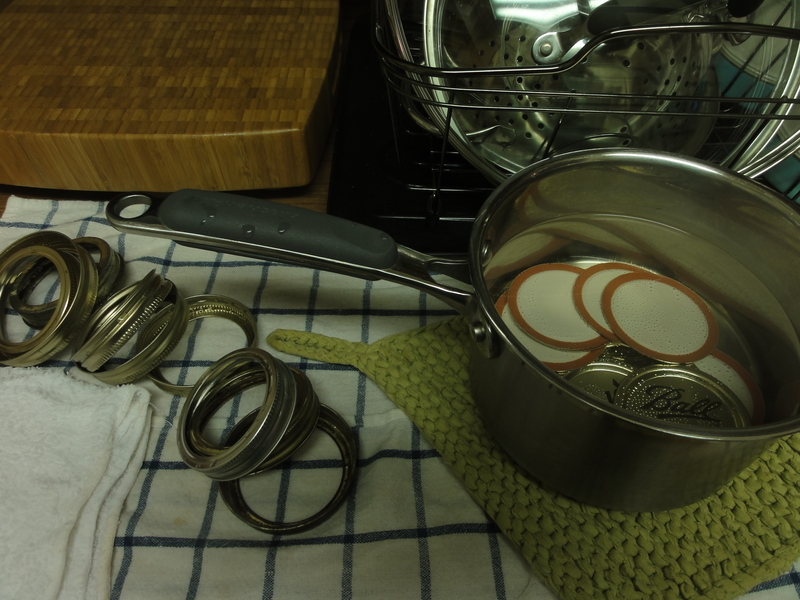 Place a ring on each jar and tighten. Turn upside down to seal and let sit for at least 2 hours, or until the jars are cool. The jam can be stored in a cool, dark place or opened and stored in your fridge for about a month or two (though it won’t last that long- it’s too delicious!). If you make a lot, you can share with friends and family, give as Christmas presents, or just enjoy all winter long!